Hot and dry have been two repeating themes over the past month, but it’s midsummer now, so those factors aren’t all that unusual. Several other appearances have been unexpected, though. I’ve tried for quite a while to get colewort (Crambe cordifolia) established from seeds and plants, so when I saw these sturdy leaves emerging, I thought I’d finally gotten one going. Thanks to eagle-eyed reader Luke, I now know that it is Siberian hogweed (Heracleum sphondylium var. sibiricum) Who knows how it got here, or how I didn’t notice it earlier. 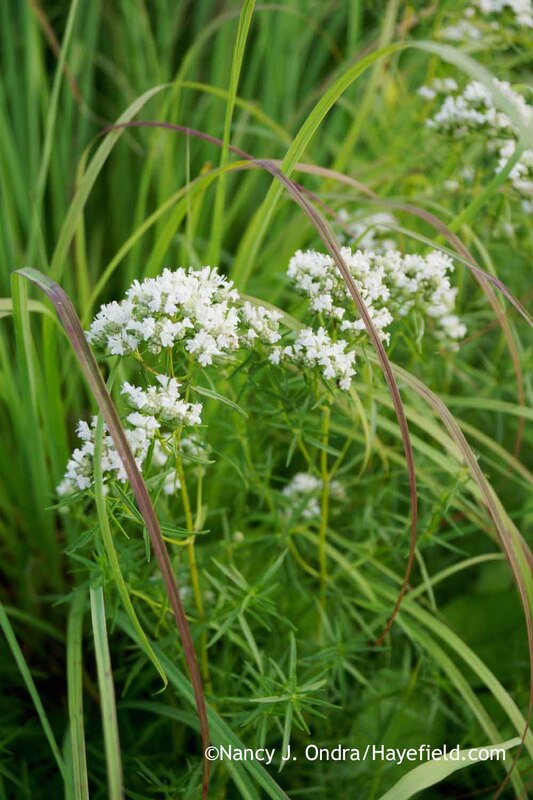 But it’s welcome to stay, since it apparently lacks the toxic properties of other hogweeds, and I like the lacy white flowers. 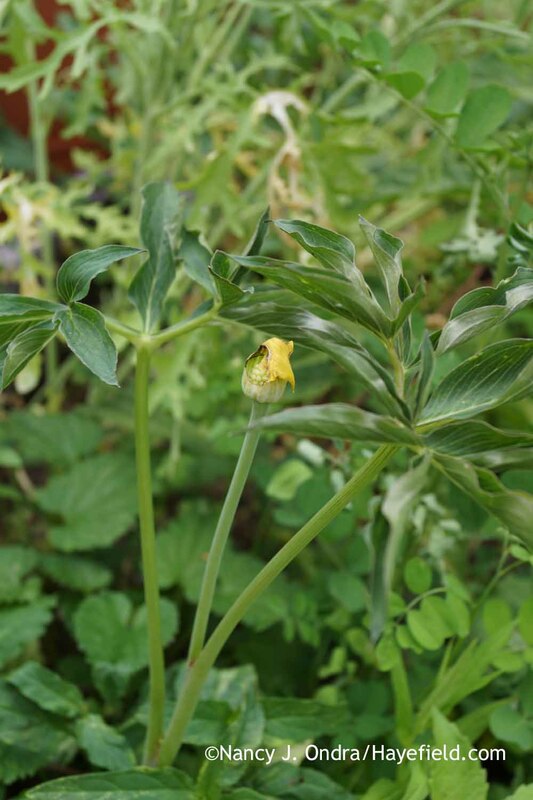 When I first saw a tiny yellow Arisaema flower in one of my nursery beds, I figured it was just a malformed bloom. When I noticed this second plant, just about ready to go to seed, I did a little research and found out that it is Arisaema flavum. 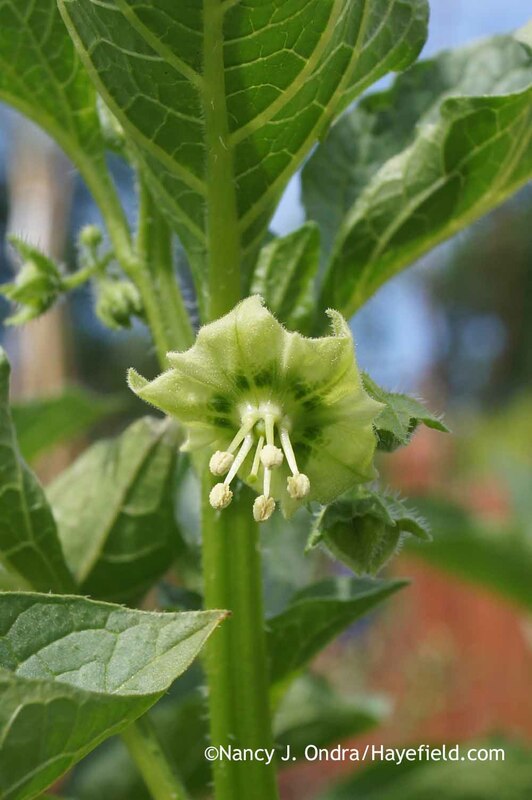 As far as I know, I’ve never sown seeds of A. flavum, and anyway, the last time I grew any arisaema from seed was at least 7 years ago. 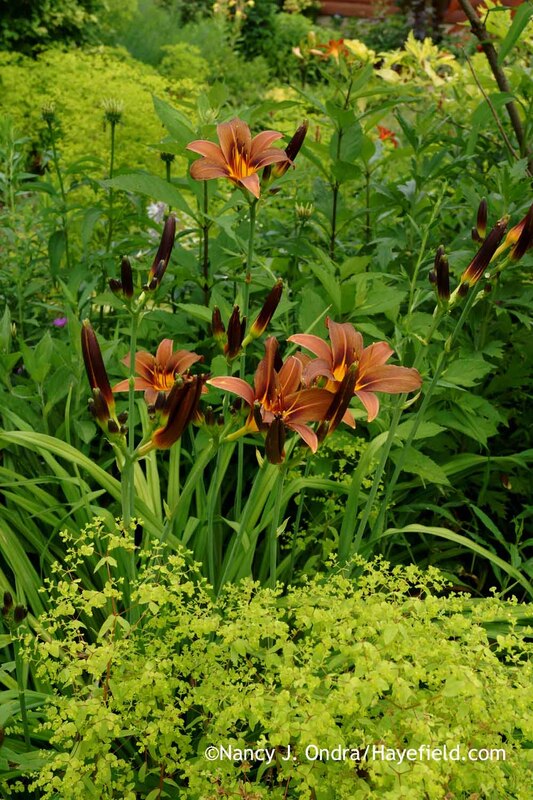 Who knows how two plants ended up being in this small, often-replanted bed long enough to reach flowering size without my noticing them before. 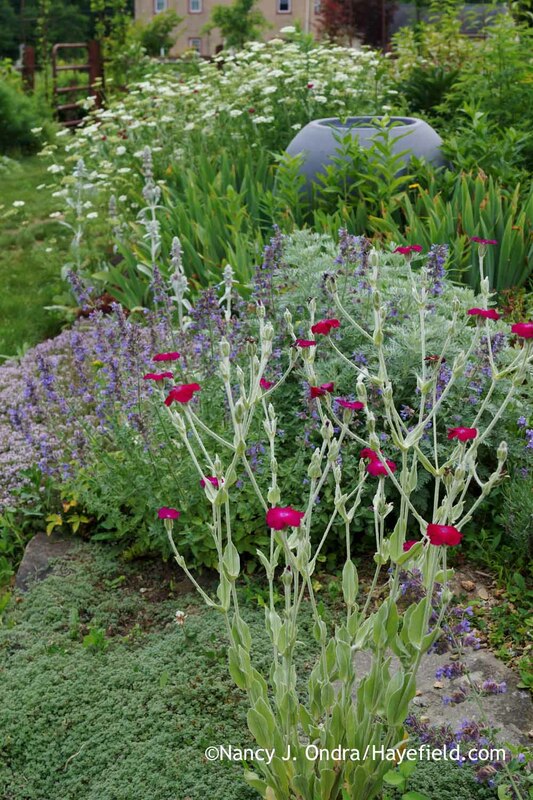 Have you ever seen those little garden signs that say “I don’t remember planting this!”? 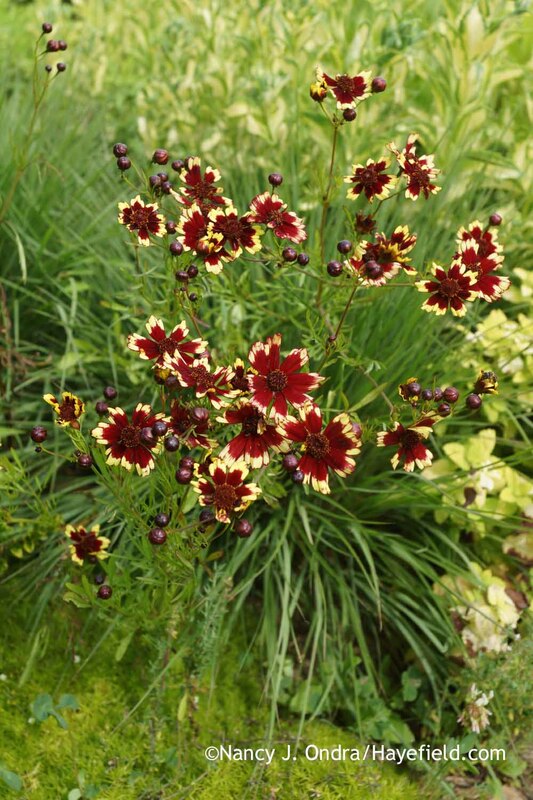 I don’t have much luck with most coreopsis, and I know I didn’t buy or sow this one. It’s not a color combo I would have chosen, either. But it looks pretty good where it is, so it can stay as long as it likes. I usually fill my larger containers about halfway with alpaca manure. 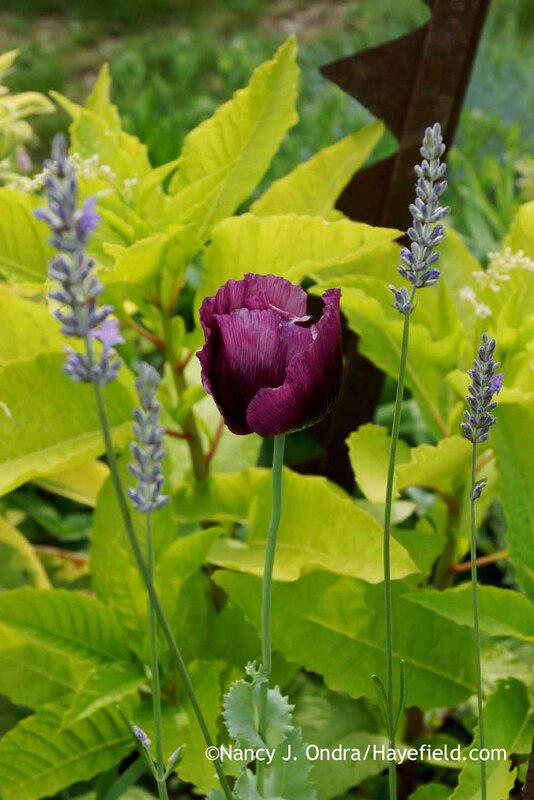 It saves a lot of expense on potting soil, though sometimes unexpected things pop up in the planting. 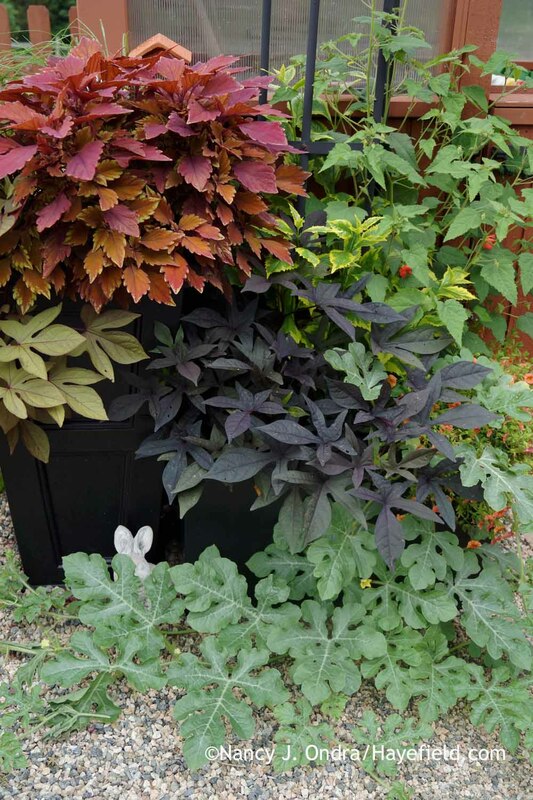 Most are weeds, but this year, a surprise watermelon vine is serving as the trailing plant in this container. What makes it even more unexpected is that I generally give the boys seedless watermelons. It’s been 7 or 8 years since the last time the Japanese beetles were bad here; I’ve seen a few here and there since then but they caused little damage, and I hoped our luck would hold for a while longer. 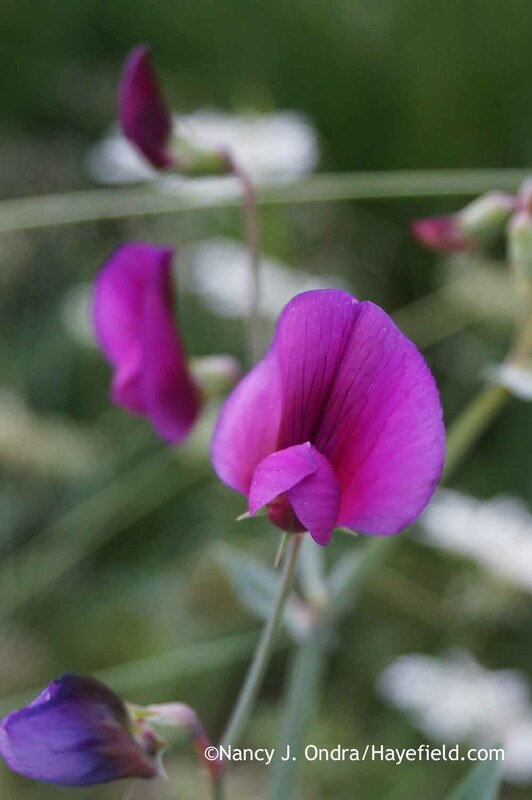 This year, however, their population exploded in my garden and meadow, and they are everywhere. That’s bad news for the grapes, roses, echinaceas, sanguisorbas, persicarias, and other Japanese beetle favorites. 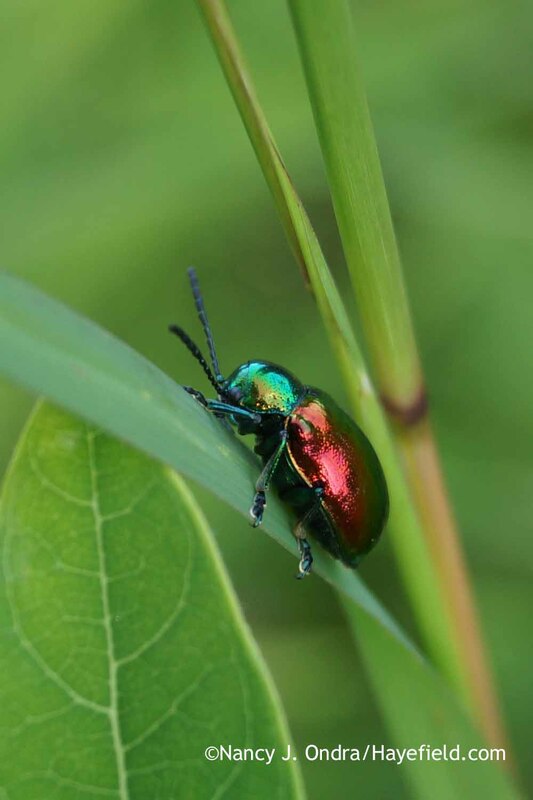 With all of the dogbane (Apocynum cannabinum) in the meadows here, it’s hardly a surprise that there are dogbane beetles (Chrysochus auratus) too, but I seldom see them and rarely have had the chance to photograph one. This garden visitor certainly was a surprise! I’ve heard him yowling around the neighborhood for years, and he occasionally chases me and the boys when we’re out for a walk, but I never realized that he came down this far. Mr. Peacock took a stroll around the garden–staying neatly on the paths and looking every bit as bored as most people do when they come to see the garden–and then sauntered back up the road as silently as he came. 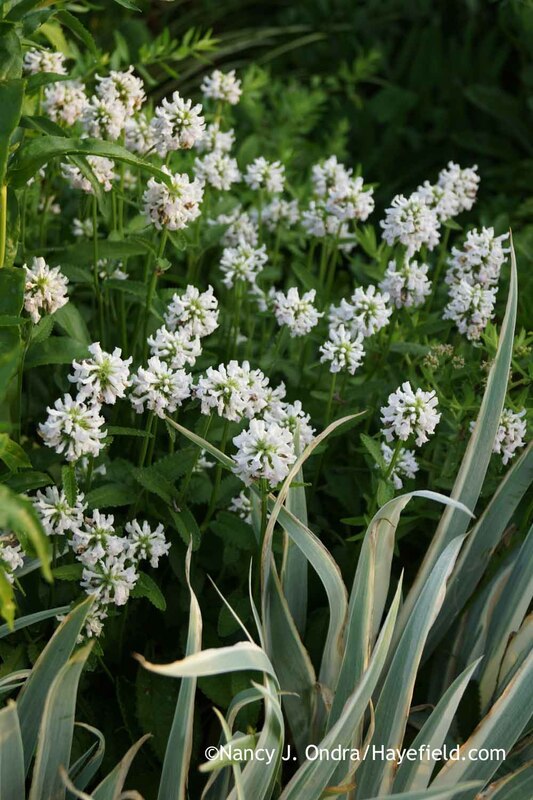 Mountain mints (Pycnanthemum) aren’t as eye-catching, but you sure can’t miss them when you brush the foliage and release their scent. 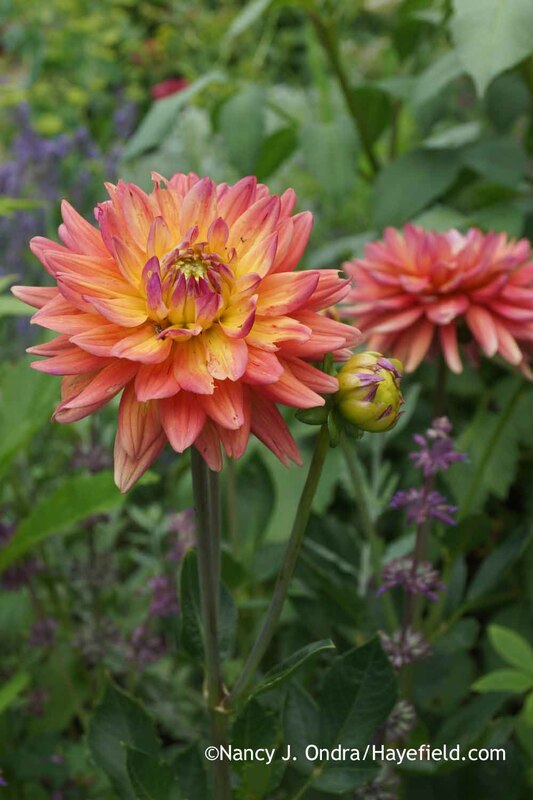 July usually sees the start of dahlia season, too. 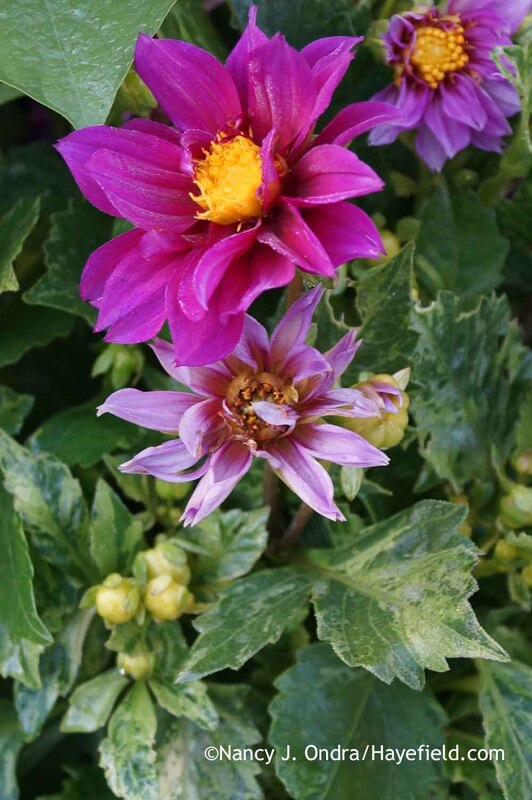 A variegated dahlia seedling from the ‘Figaro Violet’ strain. I’ve managed to keep it going from the roots for several years now. 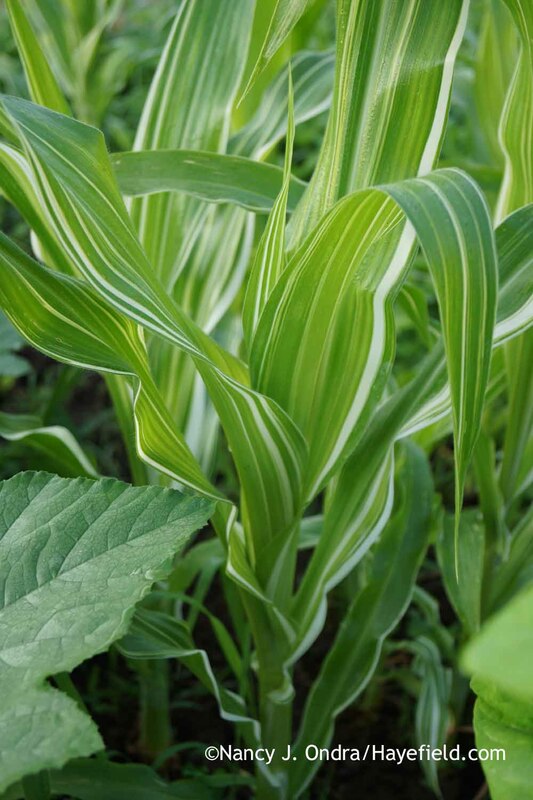 It also produces some variegated offspring from seed! Mulleins are another midsummer standard. 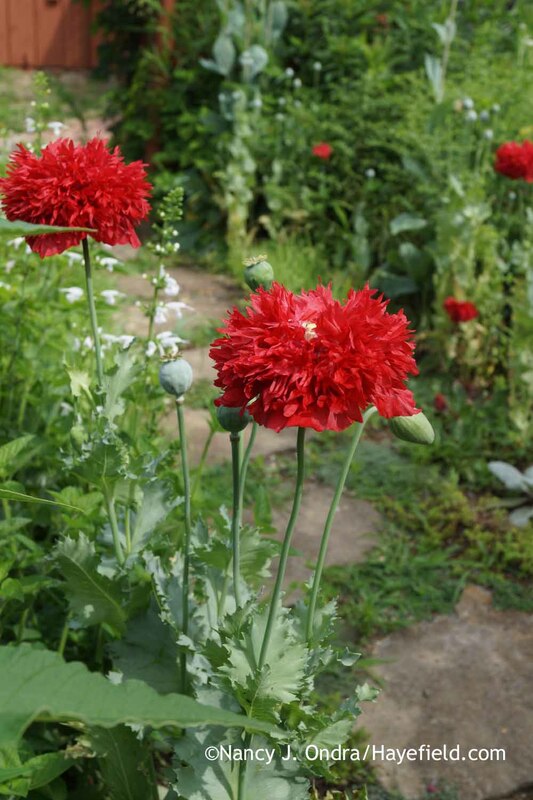 The first round of flowers from poppy plants I grew as “cherry red doubles” were a rich pink. When those plants were done, the rest bloomed in this brilliant red. New to me this year: ‘Xanthos’ cosmos (Cosmos bipinnatus). 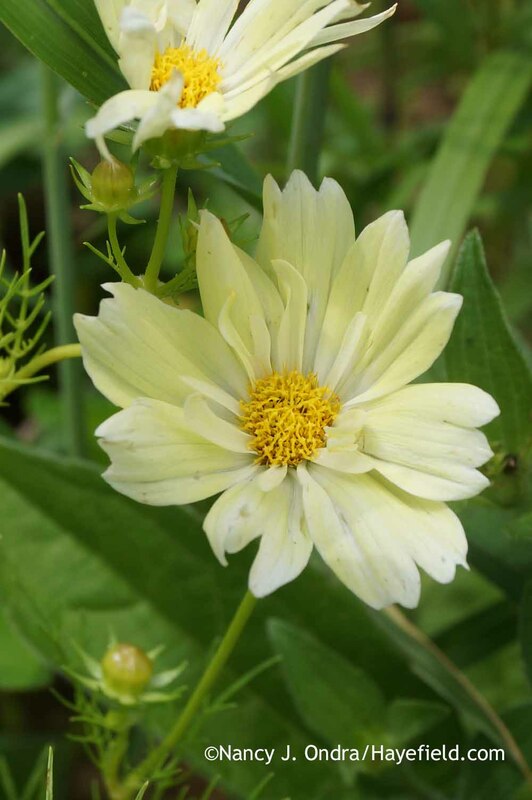 It flowered earlier than most cosmos, and the individual flowers are pretty, but you really need to keep the spent blooms pinched off so they don’t detract from the show. Now, this one is really cool! 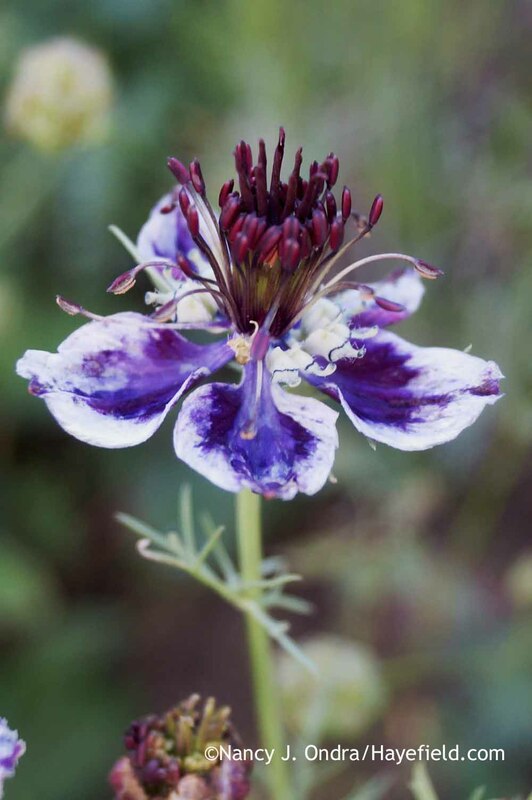 I’m hoping to collect seed from this intriguing seedling that came up in the same batch of ‘Xanthos’ cosmos. 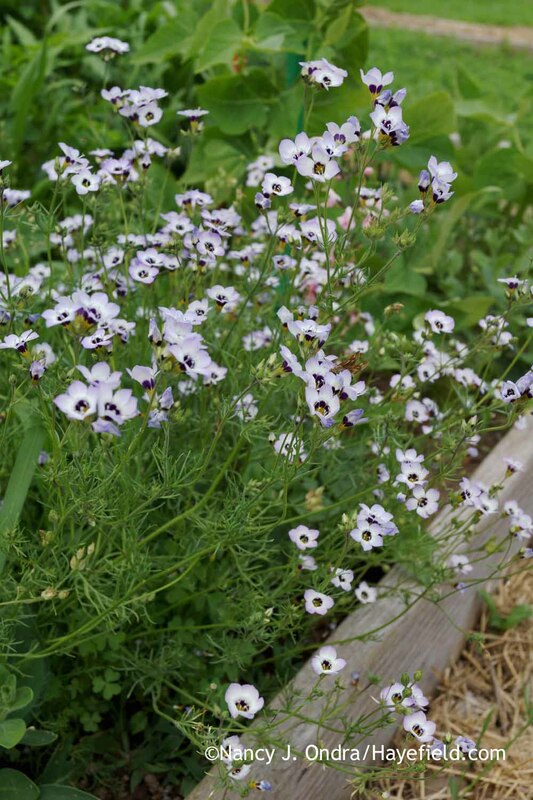 Another new annual for me this year: bird’s eye gilia (Gilia tricolor). I had just a few seeds, so I sprinkled them in the vegetable garden. They were very happy there, and now I have lots of seeds! 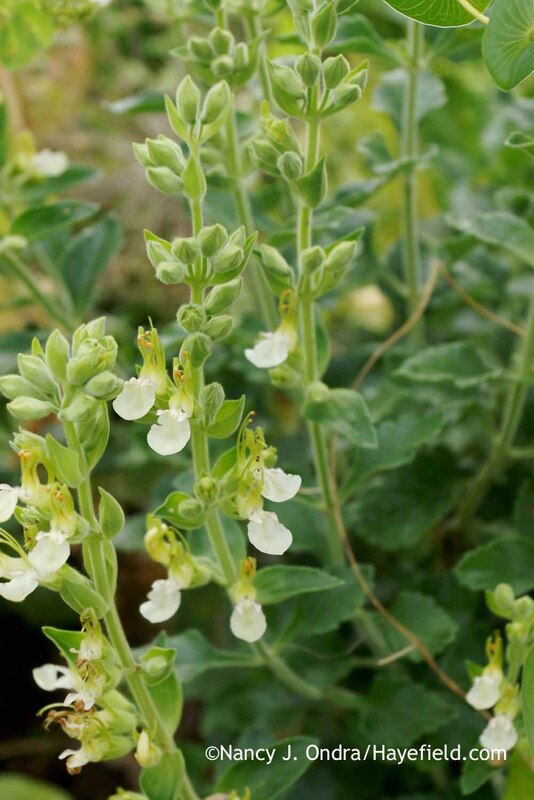 Creeping false holly (Jaltomata procumbens): a tomato relative that is flowering now. 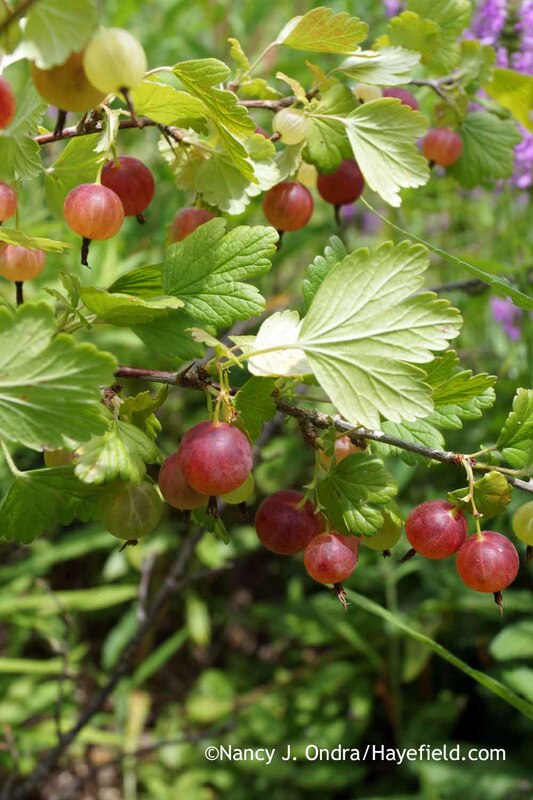 There should be many small, black fruits soon. 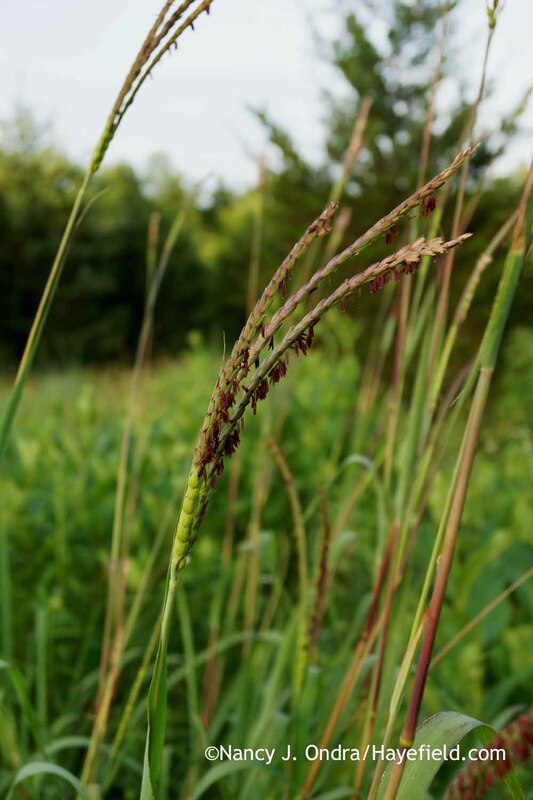 I grow quite a few plants that many people consider weeds, and I try to keep an open mind about other plants that some people treasure, even if I don’t care for them. 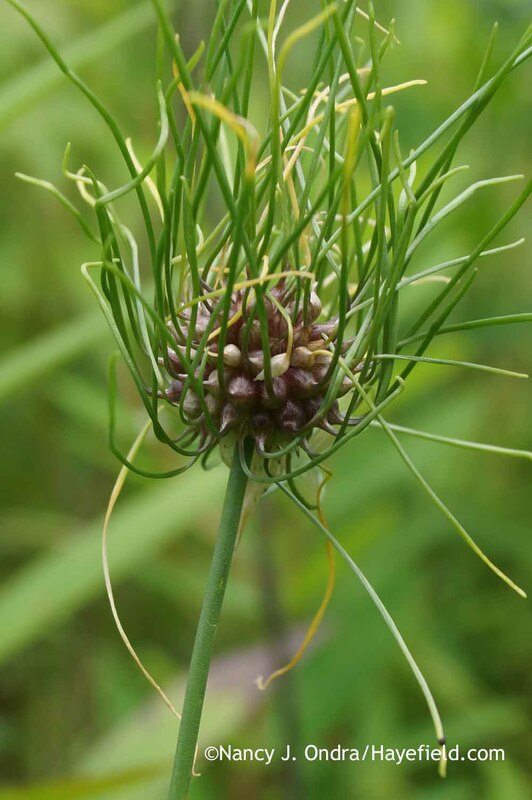 It astounds me, though, that bulb suppliers sell this as Allium sphaerocephalon ‘Hair’. It’s definitely not a variant of that species: It’s what most plants of the weedy wild garlic (Allium vineale) look like this time of year–around here, anyway. I’d probably think it was neat if I didn’t see–and pull out–hundreds of them every summer, before each head can drop dozens of new bulblets. Years ago, when I was more focused on bright colors, I wouldn’t have given branched St Bernard’s lily (Anthericum ramosum) a second look. But when I received some seeds as a gift (thanks, Rox! ), I gave them a try, and I’m very glad I did. 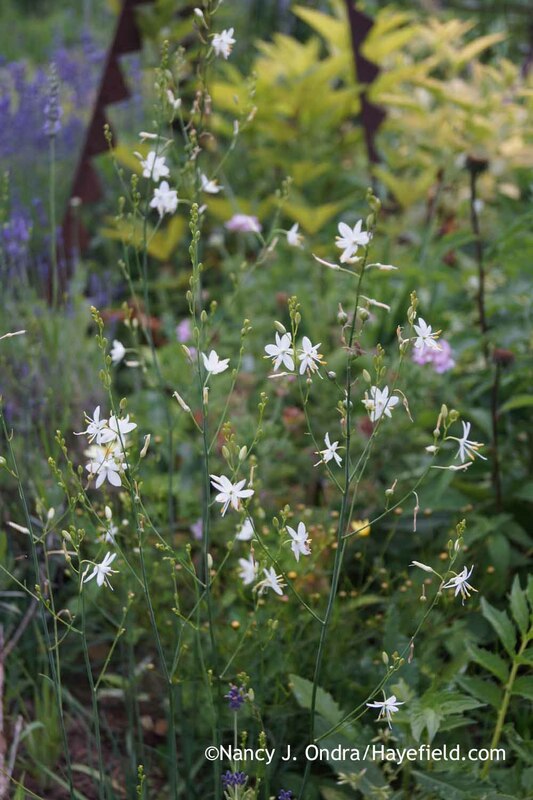 The dainty blooms appear in midsummer and make a nice alternative to gaura, which hates my winter-wet soil. 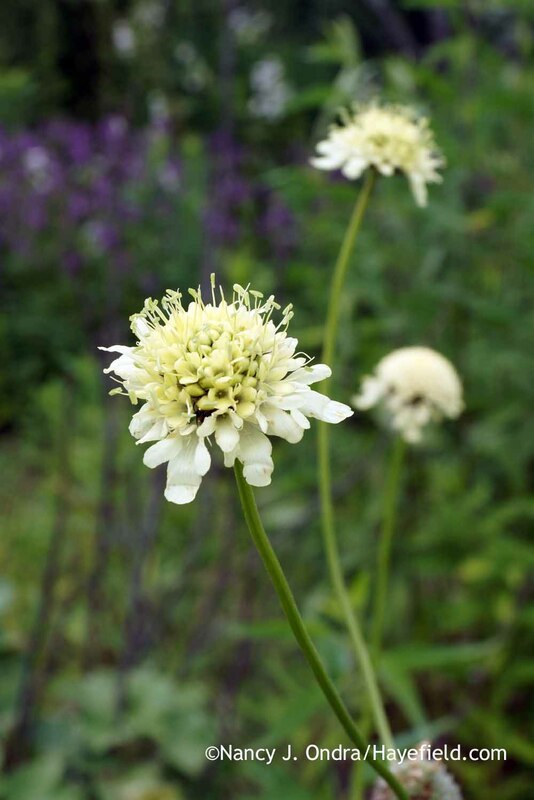 It’s challenging to get a good photograph of giant scabious (Cephalaria gigantea), partly because the flowers are held far apart and partly because they are usually buzzing with bees. I acquired this plant years ago as Coreopsis tripteris. 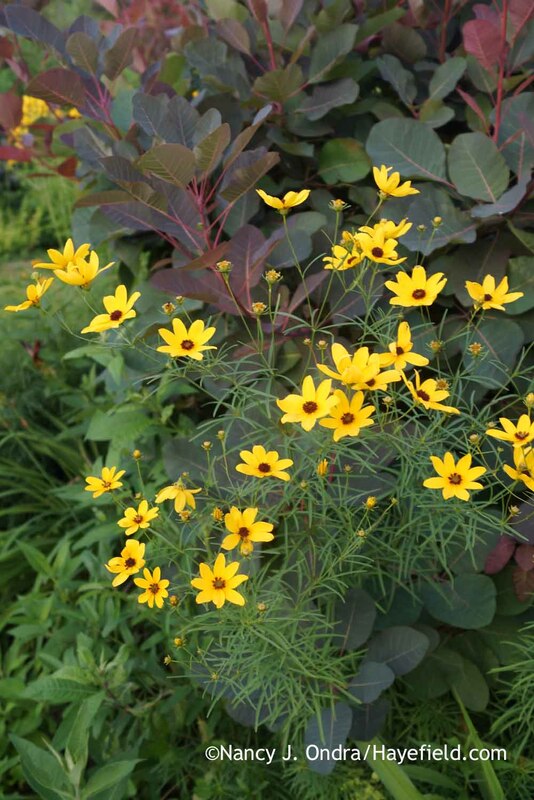 The flowers look right, but the foliage is more similar to that of Coreopsis verticillata. Could be a hybrid, I guess. 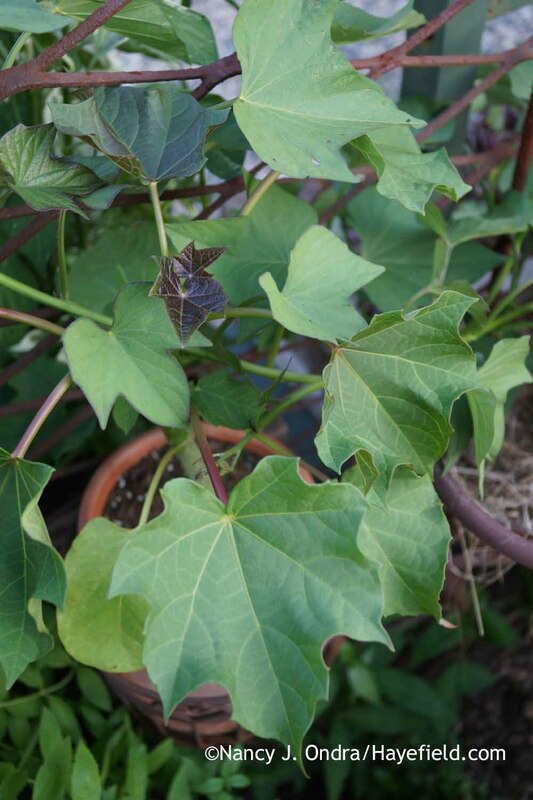 Whatever it is, it’s an outstanding garden plant, reaching about 5 feet if unpruned, with a very dense, upright habit. Here, it’s with ‘Grace’ smokebush (Cotinus). The last few blooms of pale leatherflower (Clematis versicolor) with some developing seedheads. 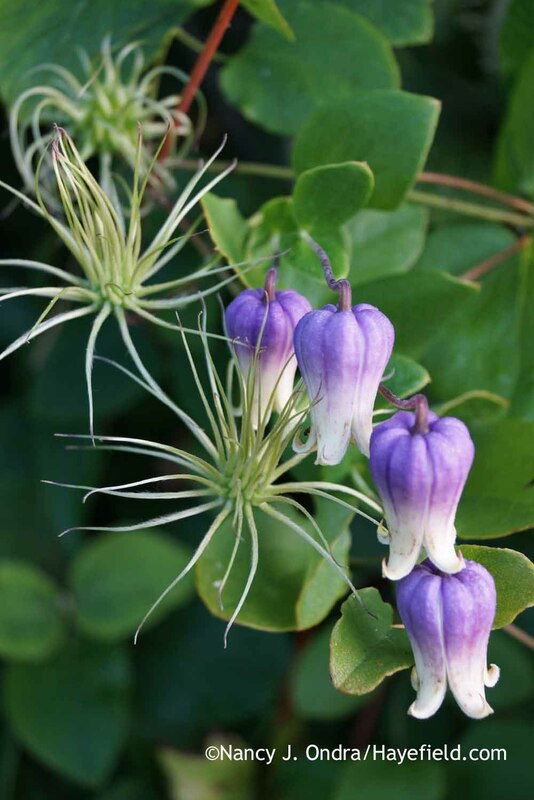 For quite a while, I wondered if my various species clematis weren’t producing any viable seeds, but this spring, I found more than a dozen self-sown seedlings throughout the side garden. It’ll be interesting to see what they look like when they’re old enough to flower. Rattlesnake master (Eryngium yuccifolium) has really made itself at home here too, and I’m happy to see it wherever it puts itself, whether that’s in a border or the meadow. 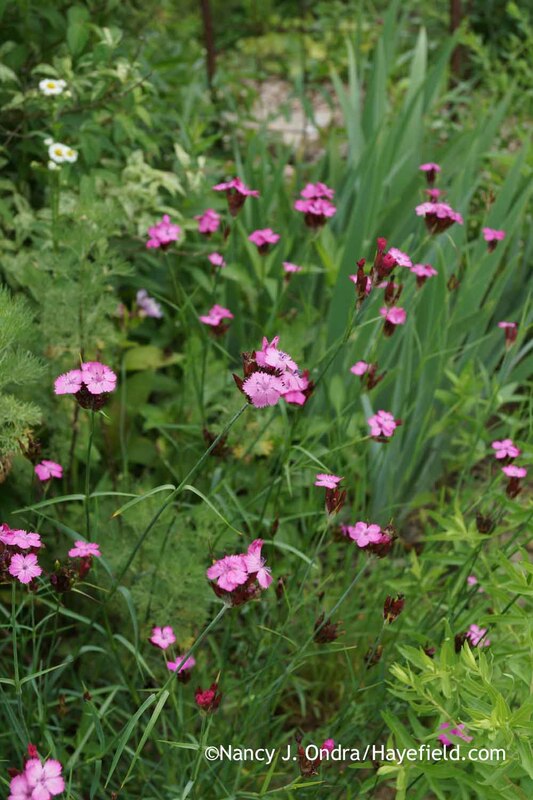 Unlike many dianthus, clusterhead pink (Dianthus carthusianorum) flowers through much of the summer. 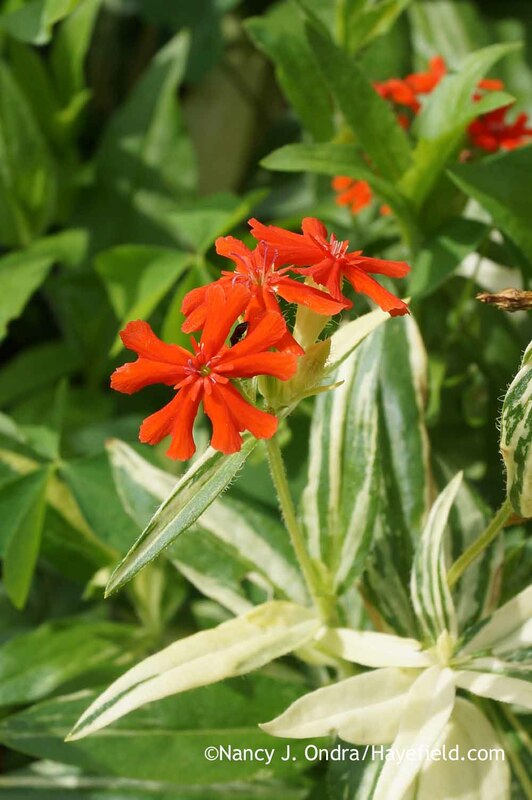 Finally: what ‘The Flasher’ Maltese cross (Lychnis chalcedonica) is supposed to look like! 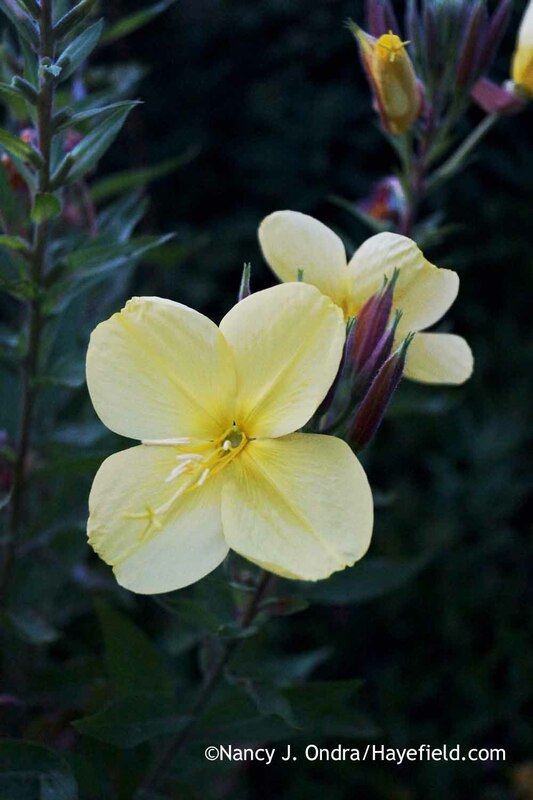 Magic primrose (Oenothera glazioviana) isn’t much to look at plant-wise, but it’s worth growing this biennial at least once to experience the magic: Over a period of several weeks, some flowers spiral open each evening, just before dusk. I posted a video of a few of mine opening one evening, but without the fragrance, you’re getting only half of the experience! 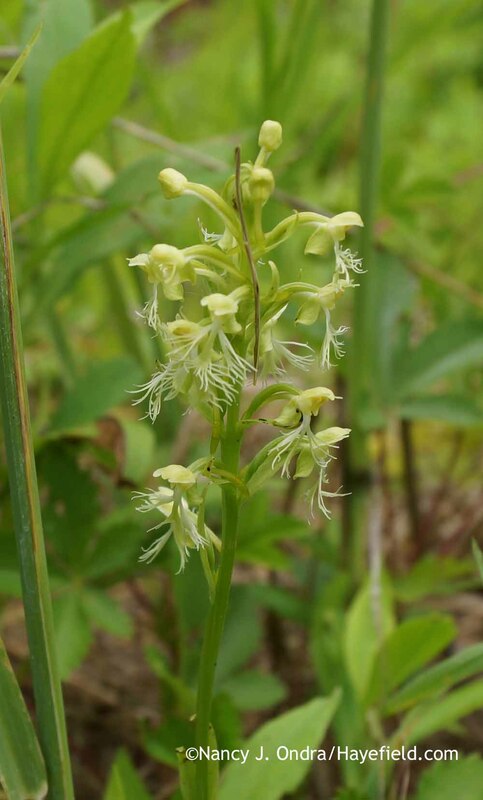 Ragged fringed orchid (Platanthera lacera) isn’t very showy, but it’s still a thrill to find an orchid growing among the “weeds” in the meadow. 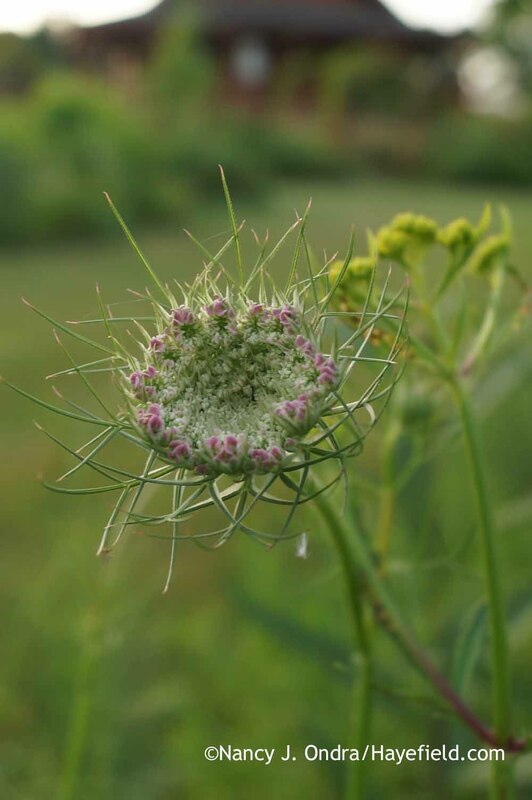 Speaking of weeds…Queen Anne’s lace (Daucus carota var. carota) is hardly special, but it can still be eye-catching. 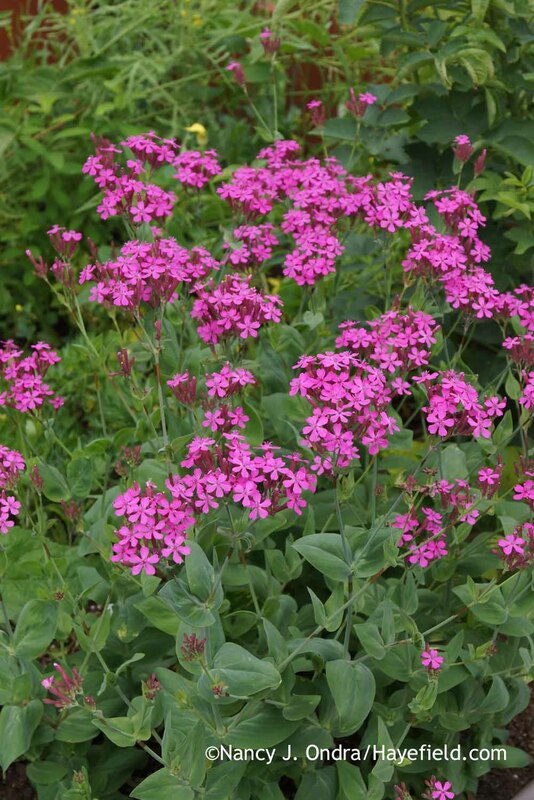 Though the seeds came to me as Lychnis alpina, I’m pretty confident that this is actually Sweet William catchfly (Silene armeria). 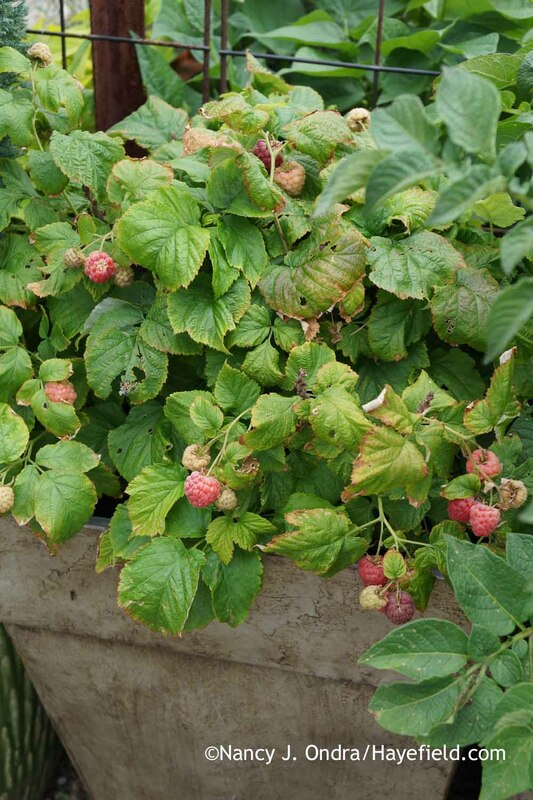 The robins and mockingbirds managed to scarf down all of my cherries this summer–I didn’t get even one–but I did get to enjoy a good harvest from Raspberry Shortcake dwarf thornless raspberry (Rubus idaeus ‘Nr7’). 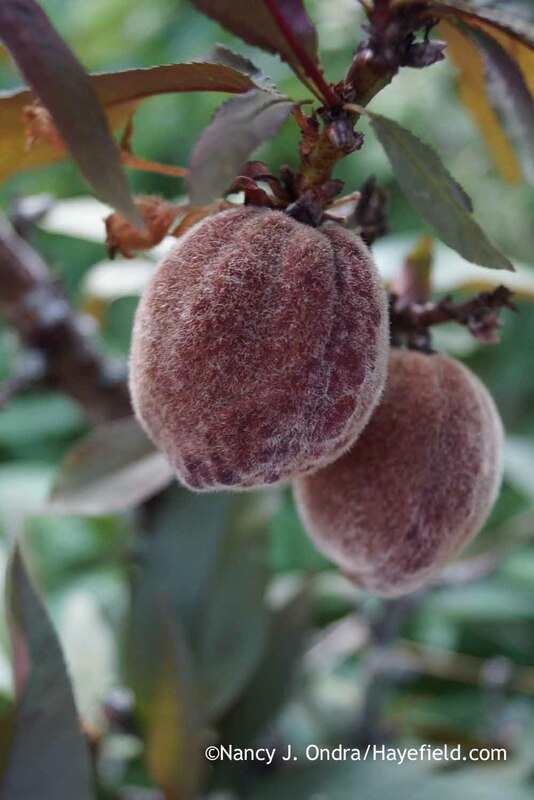 The fruits of this red-leaved peach (Prunus persica) seedling aren’t of much use for eating, but I’m happy to see them, because it means I can collect the seeds later this summer. A few leafy highlights in honor of Foliage Follow-Up, hosted by Pam of Digging on the 16th of each month. 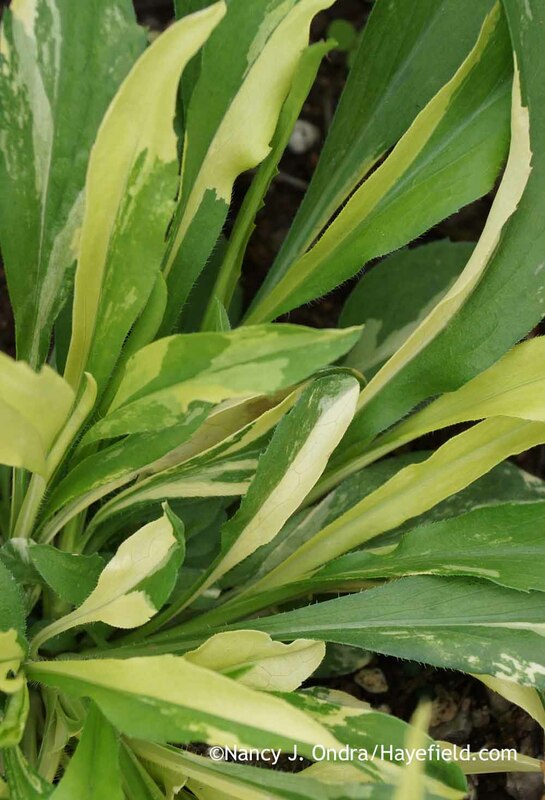 Now I know that the variegated frost aster (Symphyotricum pilosum) I found a few years ago comes partly true from seed, I can start sharing it! 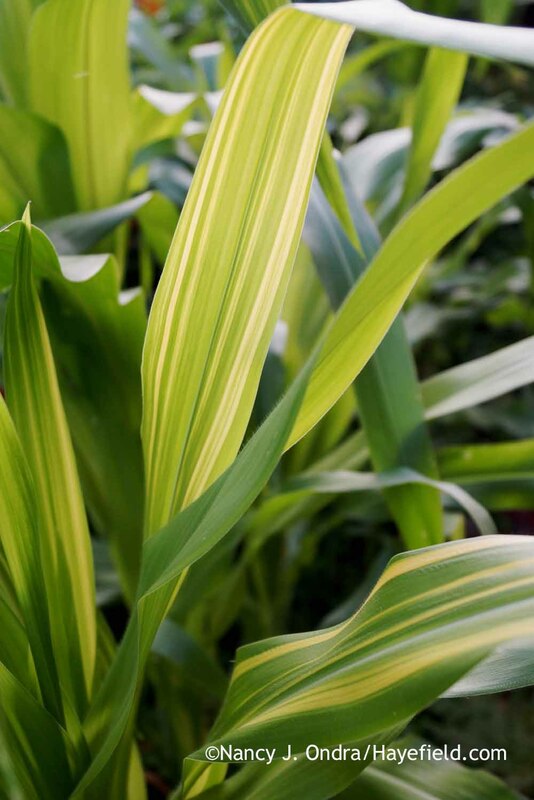 If I ever wondered why I “bother” giving away so many seeds, I got my answer: When I put out a call last summer for seeds of the ‘Tiger Cub’ corn I lost, I received some back from two readers; yay! I thought it would be good to grow out some variegated tomato plants this year too, to get a fresh batch of seed for saving. Moving on…a couple of combinations. 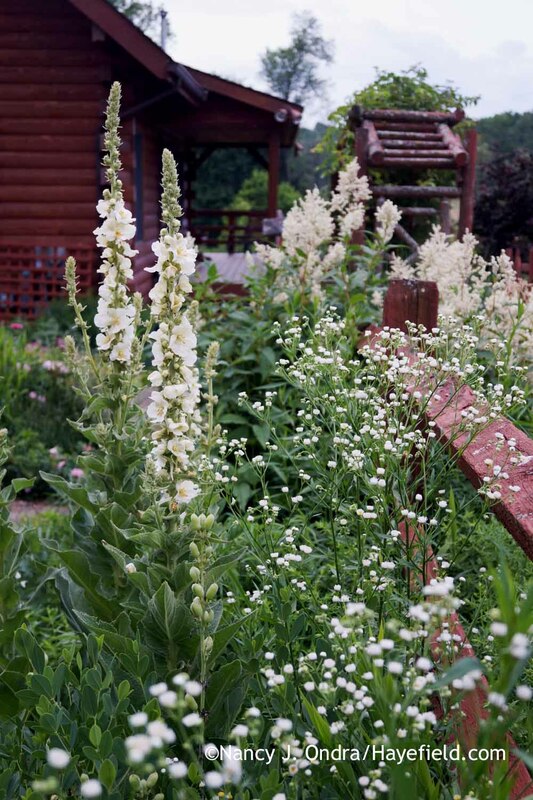 Strawberry foxglove (Digitalis x mertonensis) with yellow-leaved common yarrow (Achillea millefolium ‘Aureum’)–granted, the yarrow’s leaves don’t look yellow now, but they are yellowish green in spring. You’d think I’d remember to plant the container by the barn door first, since I see it more often than any other. Instead, I usually end up leaving it for last and then filling it with odds and ends. 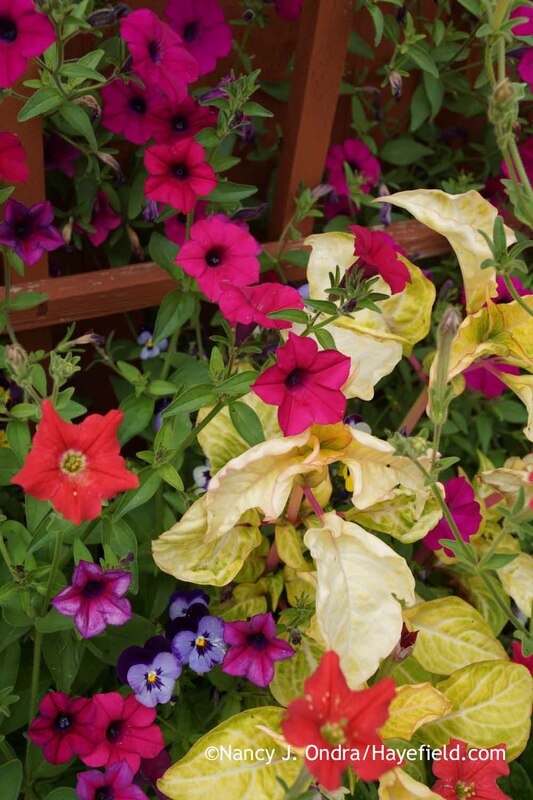 This year, the chicken gizzard (Iresine herbstii ‘Aureoreticulata’) and Petunia exserta I stuck in there have been joined by volunteer seedlings of last year’s violas and petunias. And to finish, just a few general garden shots. Too much chartreuse, do you think? 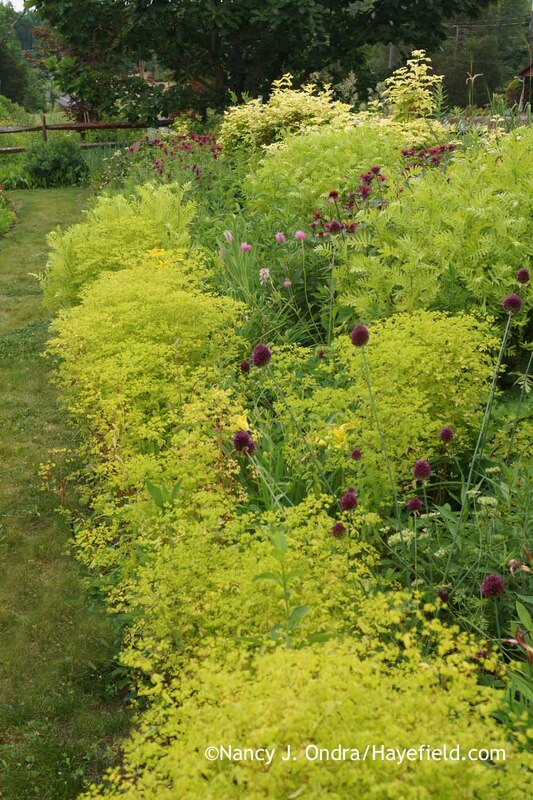 The golden foam spurge (Euphorbia stricta) and seedlings of ‘Isla Gold’ tansy (Tanacetum vulgare) are particularly abundant this year. 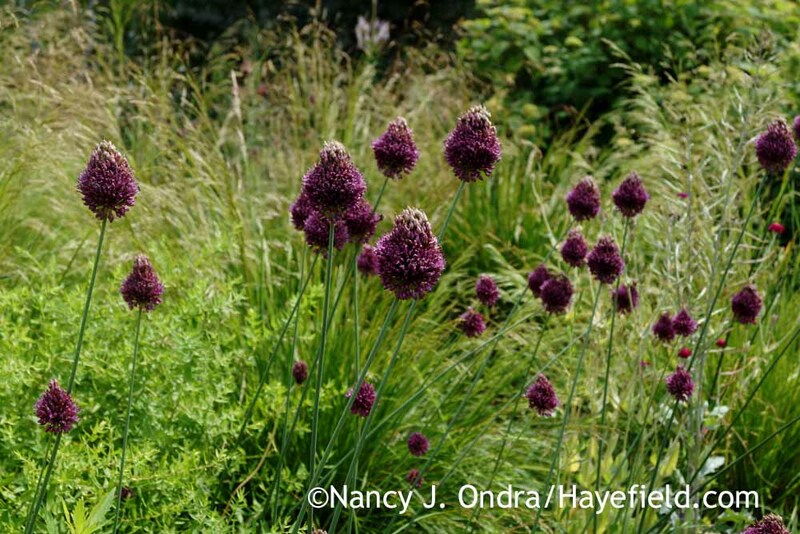 There should have been a lot more of the drumstick alliums (Allium sphaerocephalon), but…er…I accidentally pulled out many of them earlier this spring, thinking that they were wild garlic. Sigh. 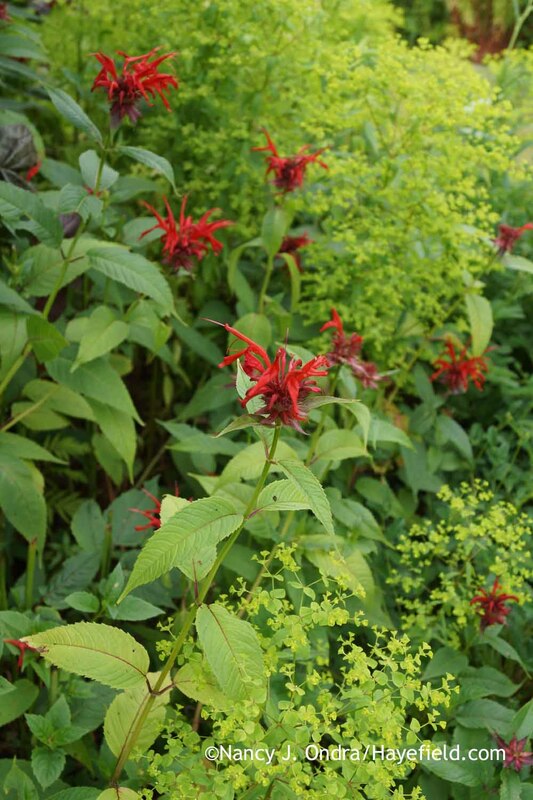 For more midsummer garden goodness, check out the list of participants in this month’s Garden Bloggers’ Bloom Day in Carol’s post at May Dreams Gardens. Aren’t you grateful that YOU don’t have to wear a thick alpaca coat in July? Good morning, Pam, and thanks! I don’t know why the Japanese beetles are so bad right here this year but scarce in gardens just 20 miles away. Oh well. 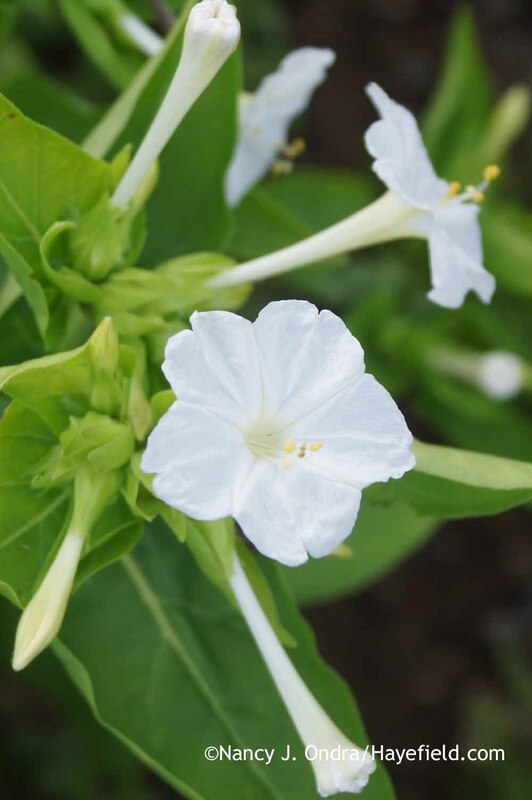 I’m very happy to hear that the petunia seeds did well for you! Oh wow… where should I start with my praises? ?I guess I should first confess that you have influenced me into a life of crime! 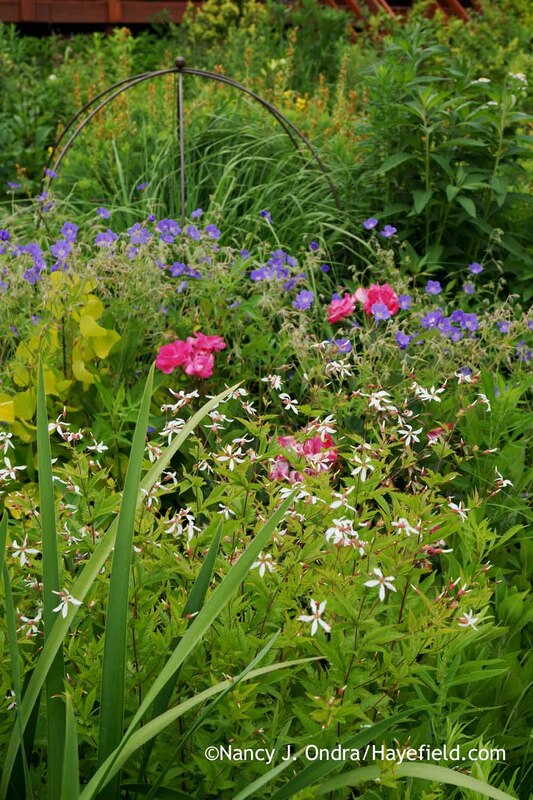 My mixed border runs along the edge of the neighbor’s neglected yard. I have been battling her wisteria vines, sumac and pokeweed for years. 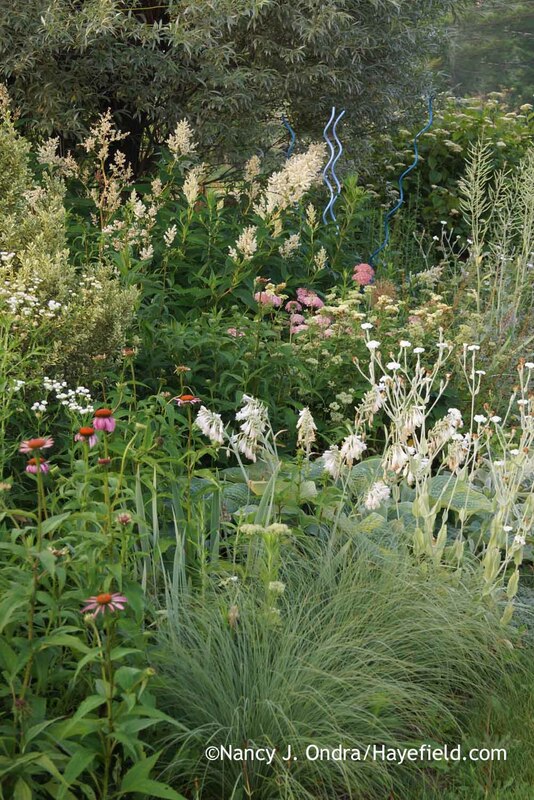 I decided to replace her “naturalized” plantings with plants I would prefer looking at. 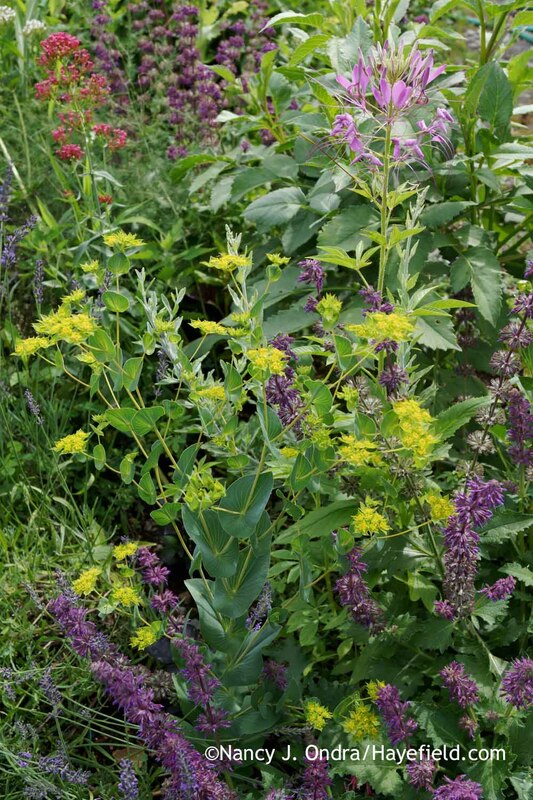 I ordered Asclepias incarnata, Veronicastrum virginicum, a very tall growing Aster tartaricus to plant right on the property line along with the Joe Pye weed I planted last year. Once they get established, I plan to keep its spread controlled on my side and allow it to take off on hers. 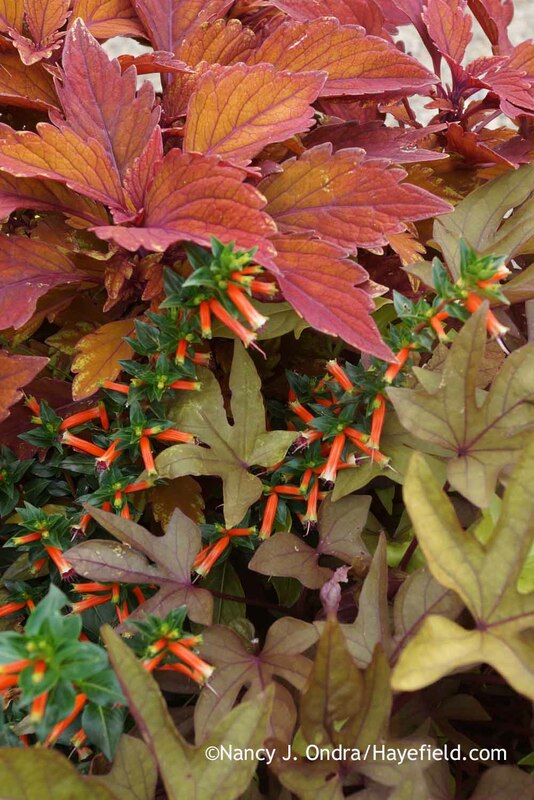 They will look great peeking out above my lower growing shrubs and perennials. I am glad to see the Giant Scabious growing well in your yard. I spotted it online and plan to order seed. I sowed Rattlesnake Master seed in my border but the only seedling that came up is about six inches away from the front edge. I like the look of a few taller plants popping up between lower growing ones at the front, but this might be too much! I like the way you think, Debbie, and wish you luck with your botanical warfare–particularly against the wisteria. 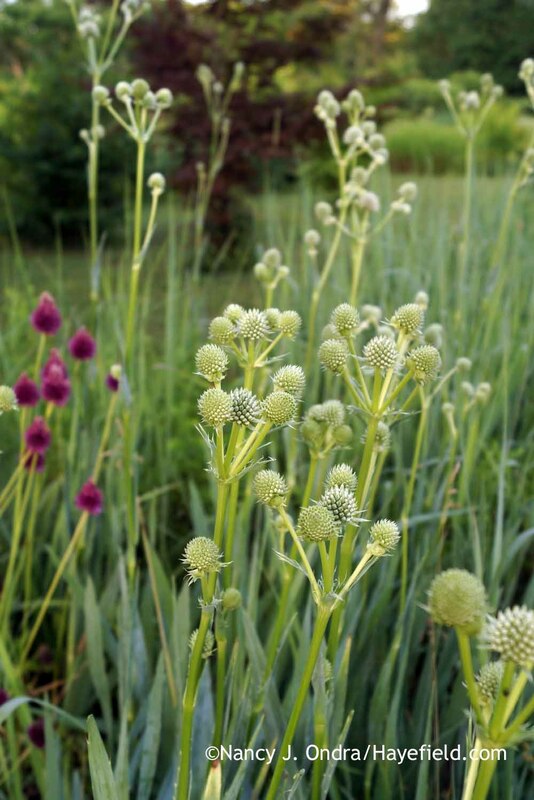 Next time you try rattlesnake master seed, maybe you’d want to sow it in a pot, just so you can nurture the seedlings and then have a bunch of new plants to set out right where you want them. Thanks for stopping by today! It’s easy to get focused on the flora and forget the fauna–at least until said fauna causes damage. I don’t often have squirrel damage, but oh, the rabbits are getting out of control this year, and the voles too. I hope your critters don’t cause too much destruction! Blown away as usual! 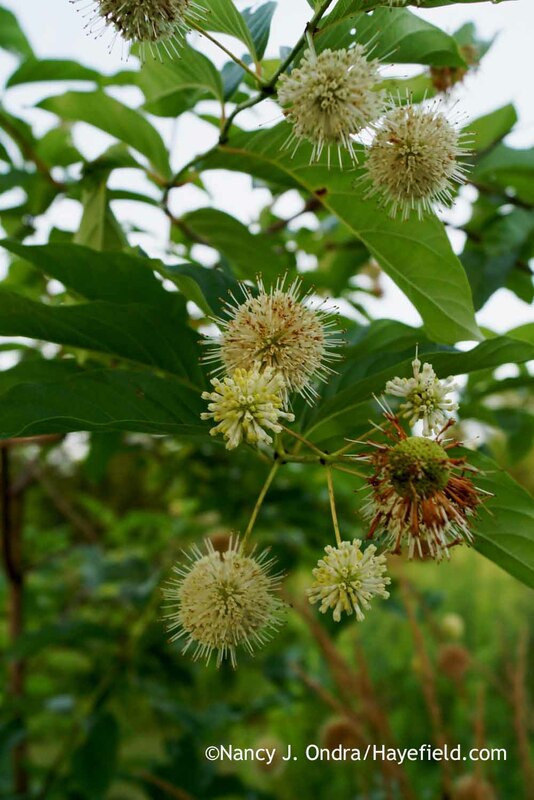 You seem a bit further along than I – lilies and buttonbush here in northern NY not quite in bloom yet. 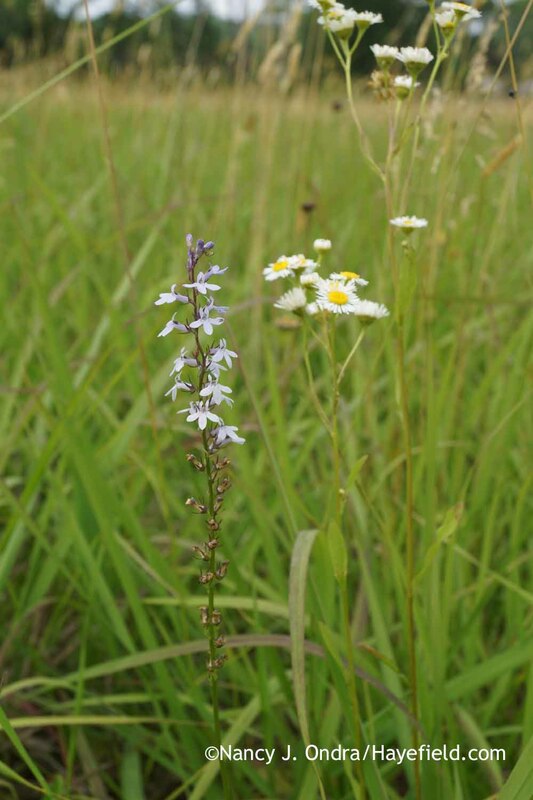 I think the heat has really sped things along: Many plants are flowering a bit earlier and for a shorter time. Sounds like you still have a lot to look forward to. Have a glorious summer, Kathy! 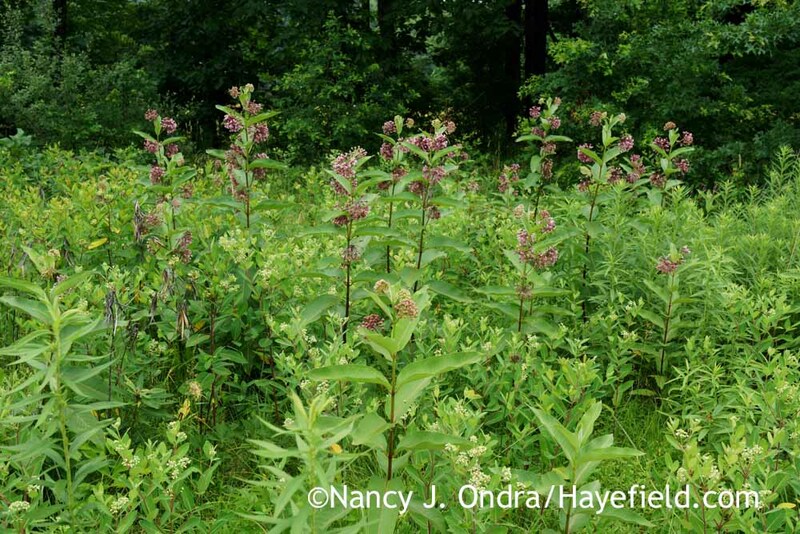 This is the second blog I viewed recently that showed cactus growing in PA. I grew up in northern PA and never knew native cactus grew in the state. I was probably too far north for them to grow in my area. I enjoy visiting “back home” through your blog. I was surprised to have luck with them here but managed (through pure luck) to have put them in a good place: under the roof overhang by my front steps, where they rarely get any rain, so the soil is dry even in winter. I’m glad I gave them a try! It is always a pleasure to sashay through your garden on the 15th. I would be so surprised to see a peacock strolling through the garden. What a handsome bird. I hope he doesn’t do any damage. Did he find the boys? Maybe he is just lonely and looking for some company. He sure is the right color to set off a lot of your plants. 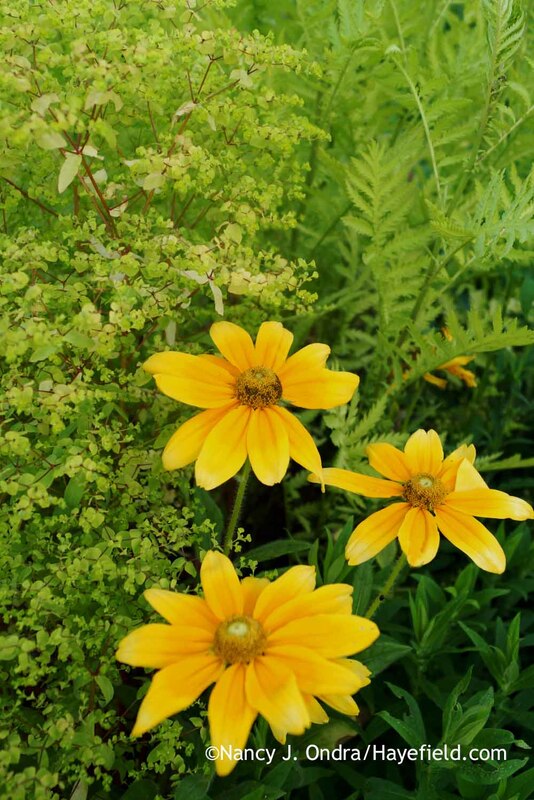 I have never heard of a 5’tall coreopsis. Those darned beetles are everywhere this year. 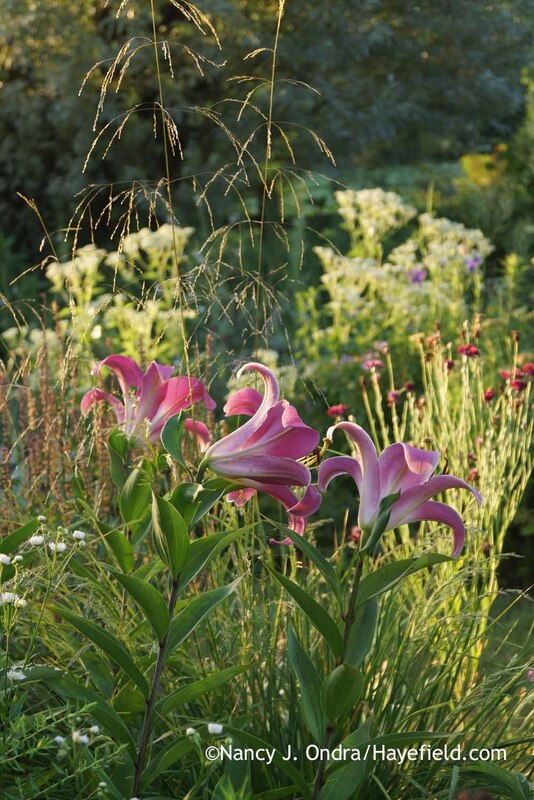 It must have been the mild winter that gave them ground.I love those tall lilies. I want more and more of them. Happy GBBD. Hey, Lisa! Nope, no damage from my avian visitor; he managed his long train very neatly. The boys were somewhat alarmed to see him–they don’t like it when he harasses us on the road–but he ignored them. His mate also lives up the road somewhere, so I guess he just wanted to get away from her for a bit. 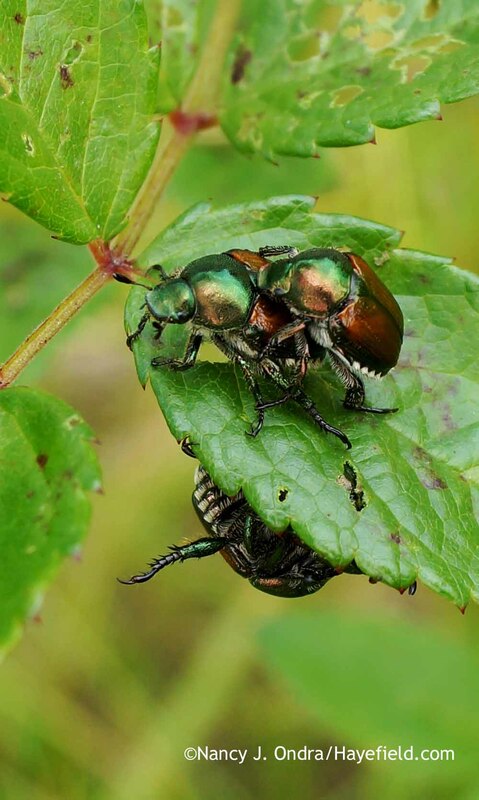 Ugh – sorry to hear that you too are inundated with Japanese beetles this year. Hope they leave you something for the rest of the summer! All very pretty. Love the mulleins. Do deer bother them? My rattlesnake master plants are ready to bloom…started from seed sent from you. It’s been a 2 year wait. Gardening has been challenging this year. Between hot and dry weather and deer damage..I’m about ready to throw in the towel. Do you have problems with deer? The deer don’t often come inside the fence but do nibble on and rub things outside. So far they haven’t bothered the mulleins, and I don’t think I’ve ever noticed deer damage on wild mulleins. I imagine that the fuzzy leaves and stems would be unpalatable. 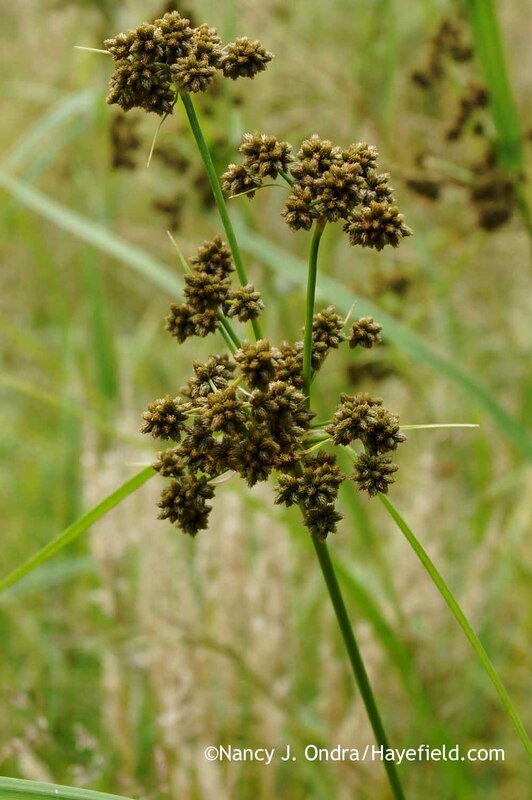 Wonderful to hear that you’ve had good luck with the rattlesnake master seeds; thanks for telling me! Love reading your posts, and today I learned something new. Two things, actually. 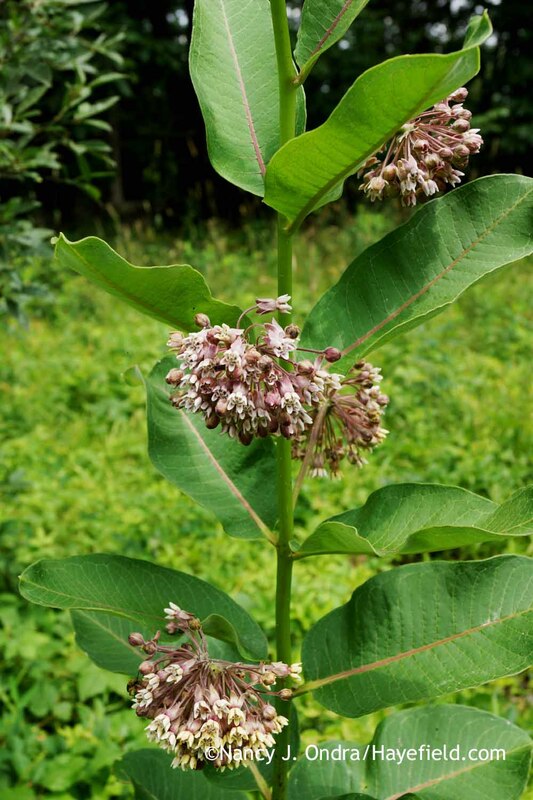 For years now, I thought the plants in my field were a type of milkweed, and today I read that it’s dogbane. 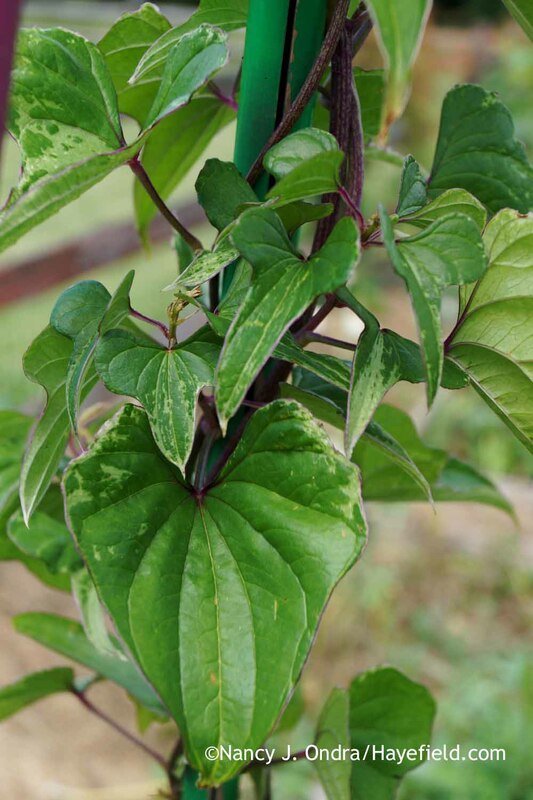 I searched this on the internet after learning that the cute little green and gold beetle on my plants is a dogbane beetle! Thanks so much! 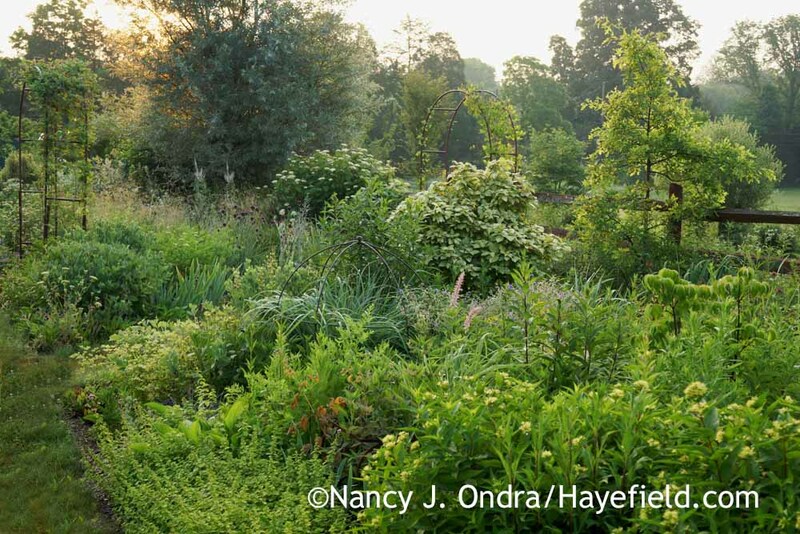 I love your photos, and really enjoy reading (and learning from) what’s in your gardens. That’s terrific, Elizabeth. It’s always exciting to connect a name with a plant. I’m so glad that you visited today! Beautiful! 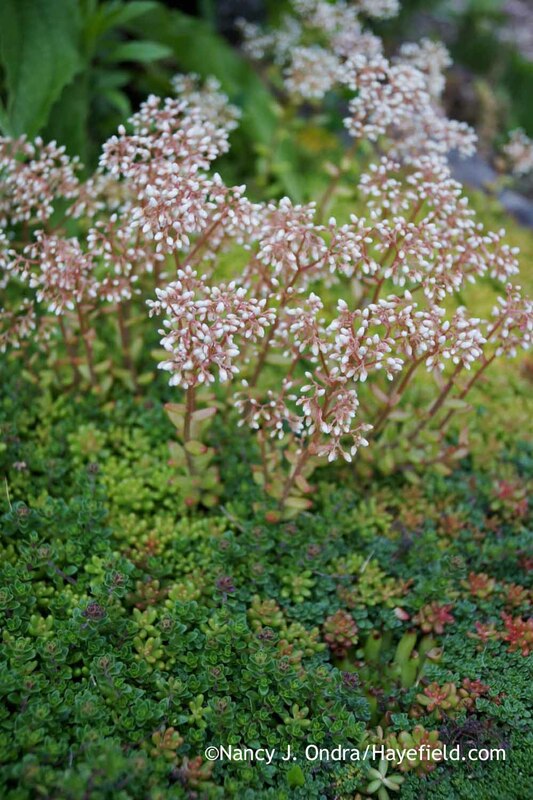 I particularly like the strawberry yarrow, may have to look into getting that. Thanks for posting. 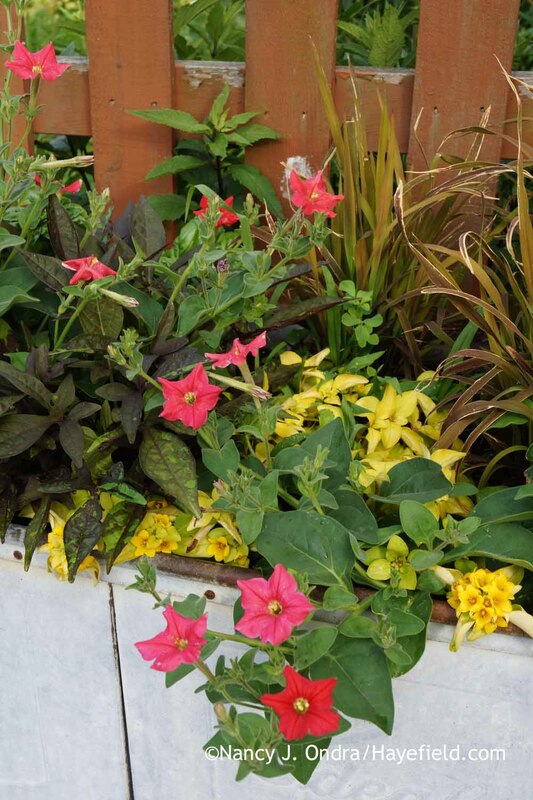 I’ve taken over a city garden bed as one of my master gardener duties and your pictures always give me such great ideas for revamping it. 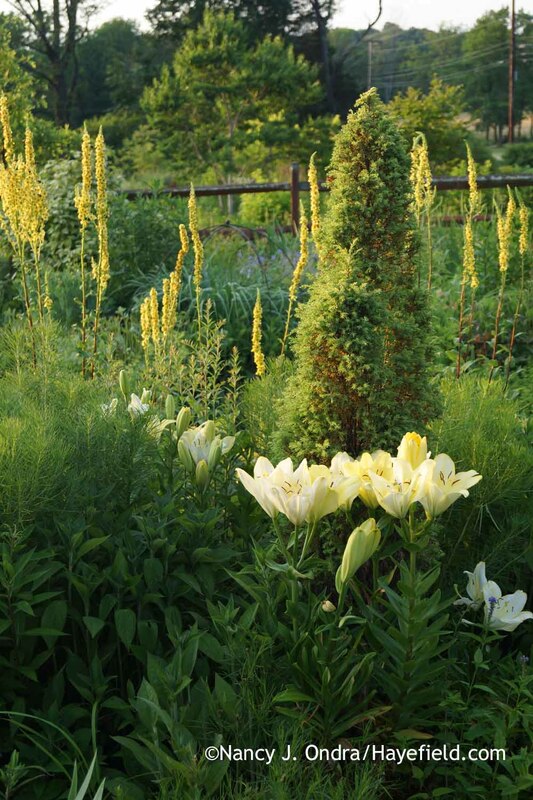 It’s currently completely overgrown with ‘Stella de Oro’ day lillies. What an exciting opportunity for you, Jess. It’s good that there’s already something there so you don’t have to replant it all at once. 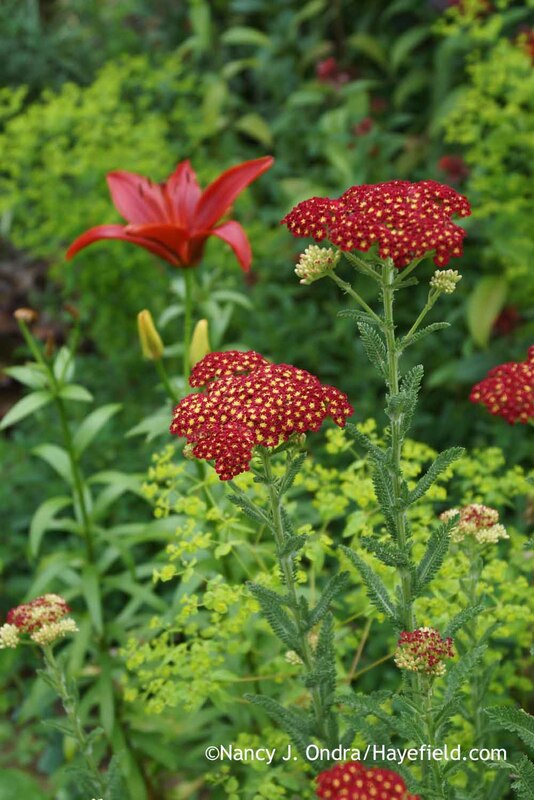 Come to think of it, the ‘Strawberry Seduction’ yarrow would probably look pretty good with ‘Stella de Oro’. Beautiful, as always, Nan! 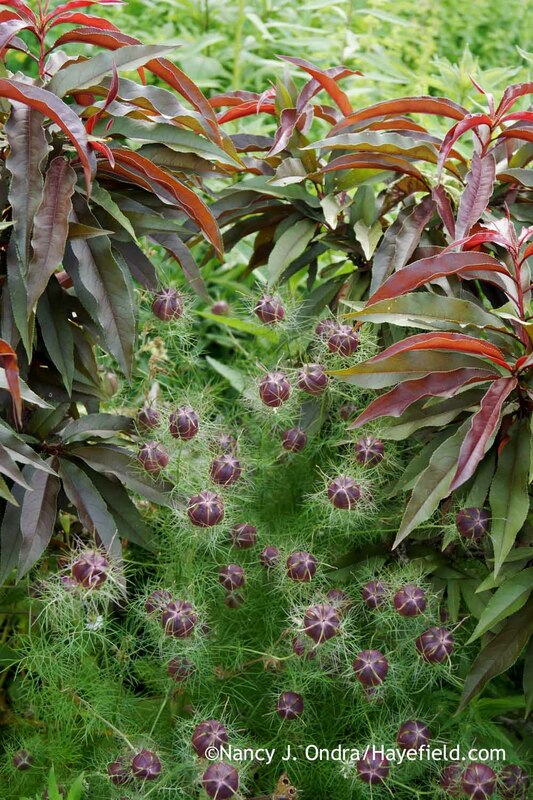 Where do you get your unusual love-in-a-mist seeds? Those were BEAUTIFUL!!! Sorry your japanese beetles are bad this year. Not yet for us in Iowa (knock on wood!). 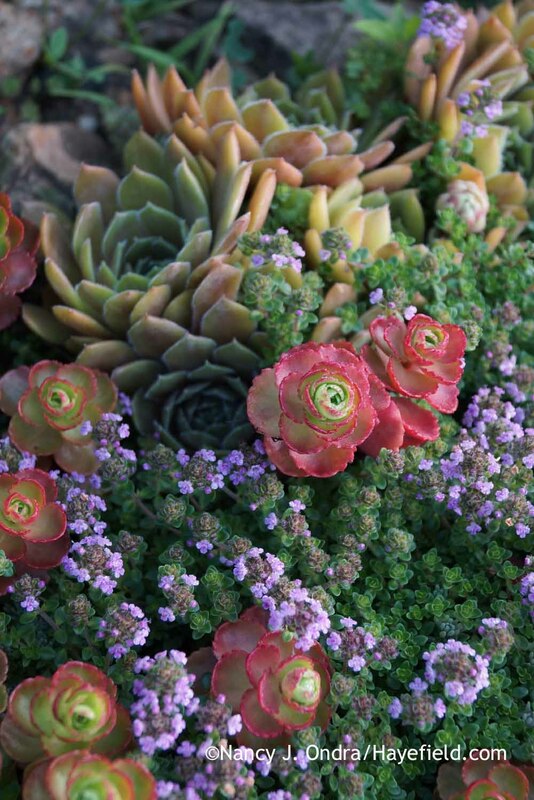 Thanks for showing us your gorgeous garden! 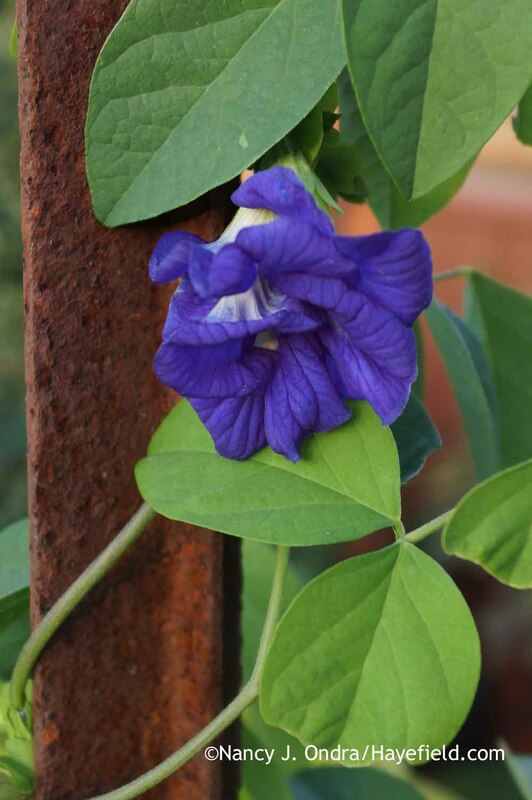 Yes, the ‘Delft Blue’ are lovely. Each one has different markings. 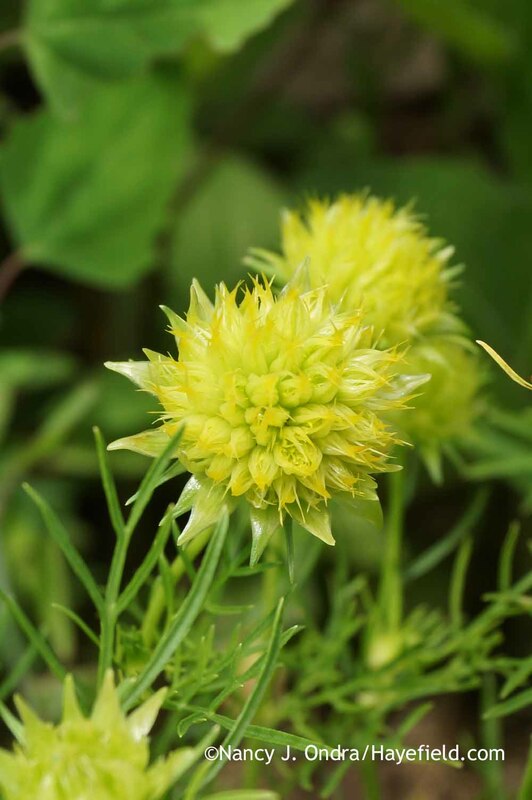 The seeds originally came from a seed exchange, mislabeled as Nigella orientalis. I hope to be able to collect seeds this year. Enjoy your beetle-free summer, Wendy! Doesn’t this just make your heart sing to see such gorgeousness? You are truly gifted in your artistry in the garden! You’re so kind, Laurie. 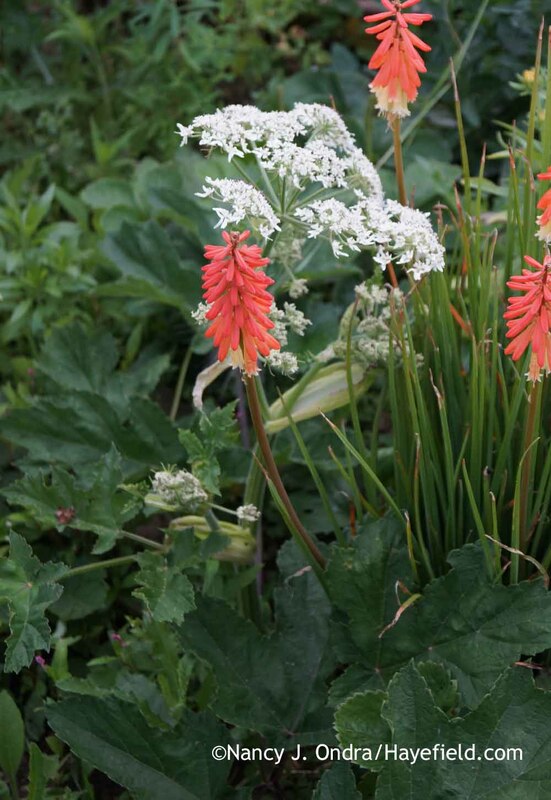 My garden does make me happy–even with the drought and the pests and the weeds–and having readers like you to share it with makes it even more of a pleasure. 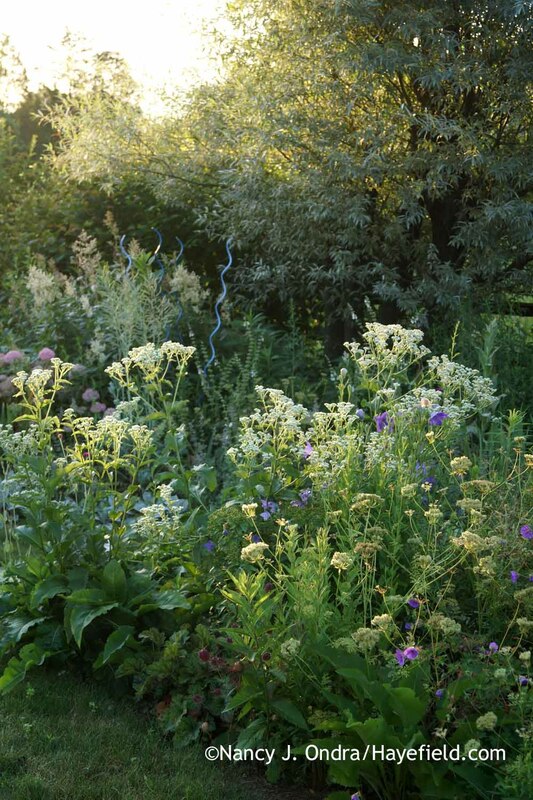 That hydrangea in the side garden is gorgeous; is it the native H. arborescens? I’m eager to get some going here but don’t want the big ball-flowered kind, and the straight species is hard to find in commerce. I wish I knew for sure, Nell. I bought it 15 years ago from a nursery that was going out of business, and it didn’t have a label. It could well be H. arborescens. 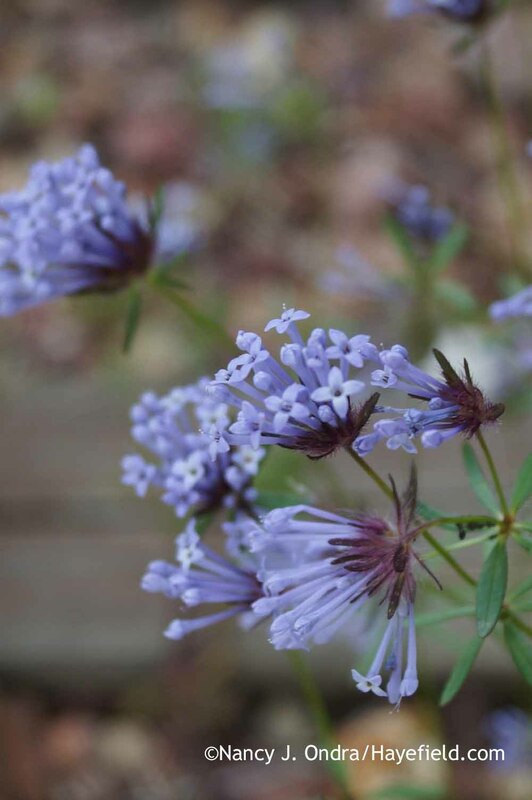 I used to cut it to the ground each year but stopped pruning it several years ago, because I too like the smaller flower clusters. Maybe I can collect seed from it this year. As I expected, Nan, your summer garden is glorious! 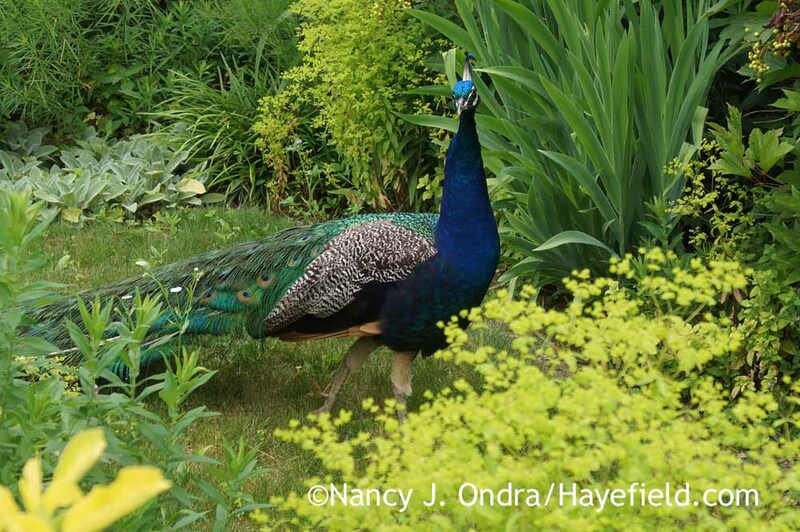 I was surprised to see the peacock in your garden, though – he’s very handsome and, as long as he didn’t eat everything in sight and make a holy racket, he makes a nice addition to your garden’s ambience. They’re all over the peninsula here and have their friends and their foes among the local population but only juvenile males show up in my garden and they don’t stay long, which probably is due to the active presence of coyotes. 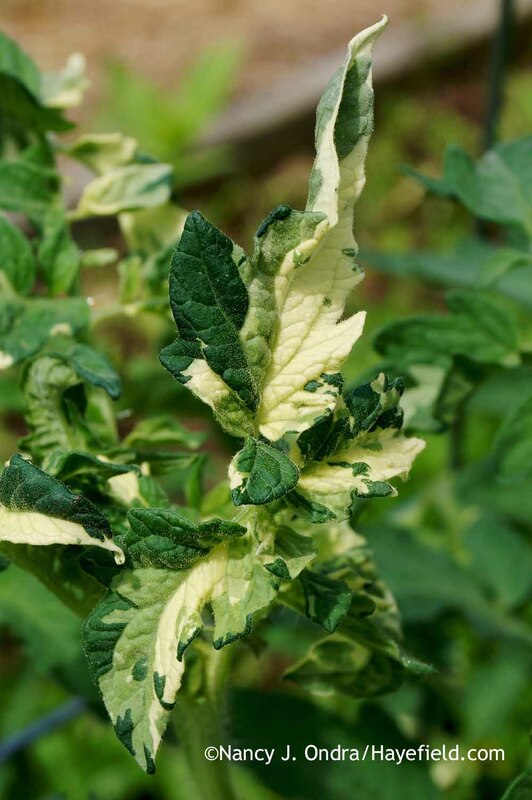 I was fascinated to learn that there are variegated tomato plants and will have to hunt them down next summer. Thanks, as always, for sharing your beautiful garden! Oh my, Kris–I think I’d rather have peacocks than coyotes…except that the latter might help to take care of the rabbit overpopulation. I’m not sure if they’d be a danger to the boys, though. The variegated tomato–which I’ve gotten from various sources as ‘Variegata’ and ‘Splash of Cream’–is indeed interesting, and if memory serves, the taste is pretty good too. I’m also growing out ‘Lutescent’ this year. 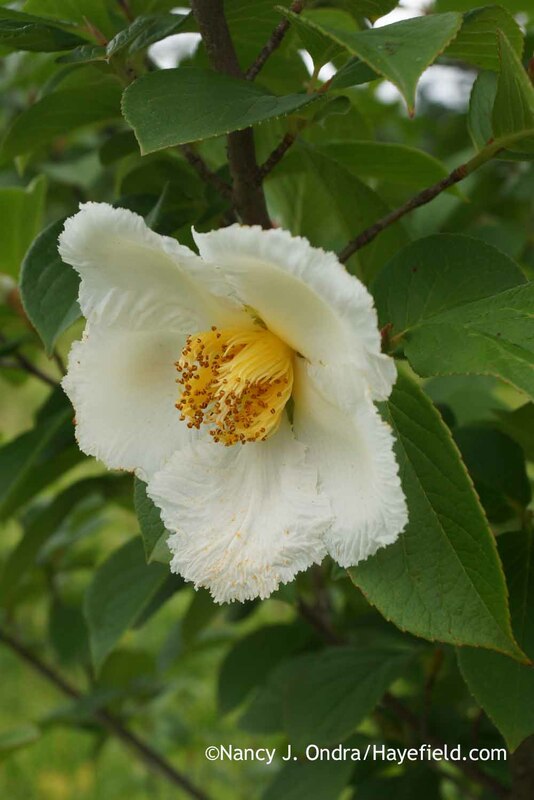 It has whitish flowers and yellowish foliage, which, as you can imagine, make it look rather sickly, but it’s an old variety and an interesting curiosity. Oh dear, I hope Mr. Sky isn’t bothering you! Both males (Sky & Blue) are wanderers – once they get free they are nearly impossible to catch. Sky still has his tail, Blue has molted already for some reason. I hope they leave you some feathers in return for the privilege of strolling through your beautiful gardens. It always delightful to drive past your house every day and I love watching the progression of the seasons through your gardens! Hello, Norma; it’s a pleasure to meet you! I have to admit that I didn’t realize that there are two males, even after all this time. I wonder if Blue is the one who objects to us walking by sometimes; Sky seemed very easygoing about me following him with my camera and paid no attention to Duncan and Daniel. Either way, the visit was a delightful and memorable surprise. Maybe we’ll get to meet you in person one of these days! Hi, I’m new to your blog and enjoyed this post so much. You have a number of varieties I’ve never encountered before, despite gardening for 25 years, so that was very fun to see. 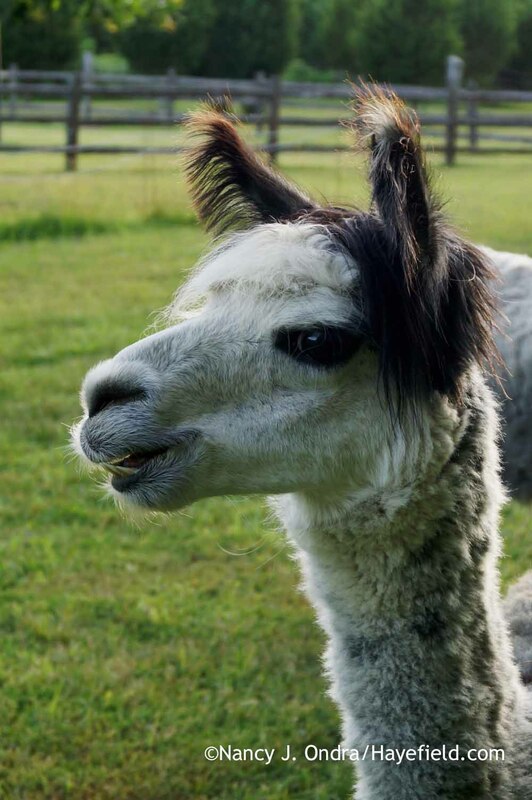 And who doesn’t love a sweet alpaca face on a Friday morning? Welcome, Tracy, and thanks for stopping by to take the virtual tour. It’s fun to see what other gardeners get up to, isn’t it? I feel particularly lucky to see *two* sweet alpaca faces many times a day! 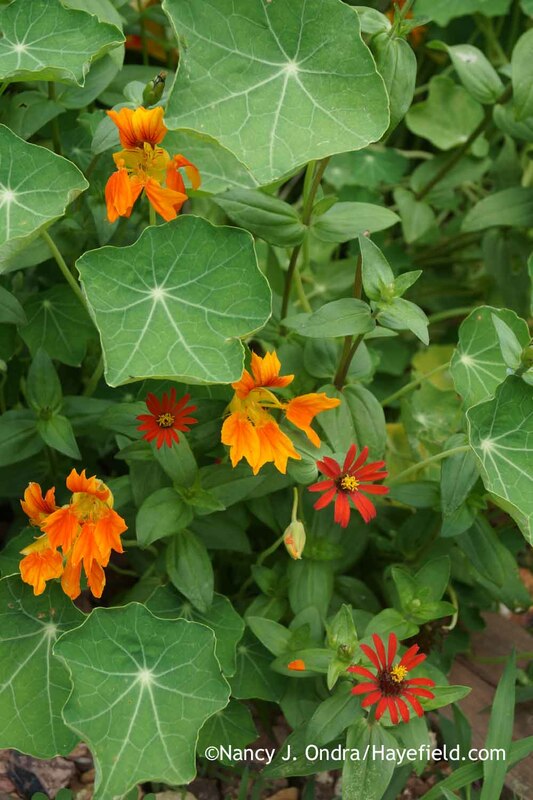 I think we have gone for similar seeds this year , I planted : Zinnia ‘red spider’, Cosmos Xanthos, Maltese cross ‘Dawn sky’, Gilia tricolor and Four o’clock ‘fairy trumpets ‘. I seem to be bit behind you though , mine aren’t that nearly as mature. And no sign of Xanthos yet ! Sounds like we have very similar taste in neat plants, Linda. I’m sure yours will catch up soon. I started my ‘Xanthos’ on a heat mat in mid-April: overkill for cosmos, but I had only a few seeds and wanted to give them a quick start. As always, so much to learn from you, Nan. 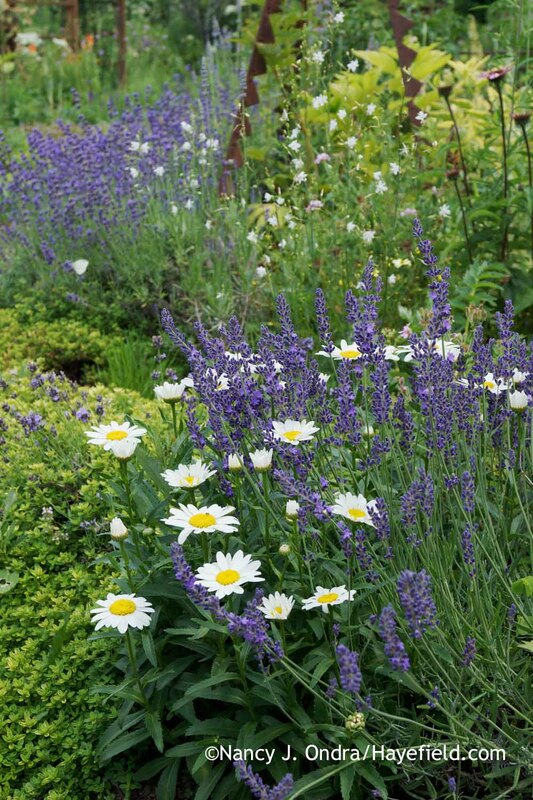 I’ll be checking your seed offerings for so many of these, including that fab nigella. 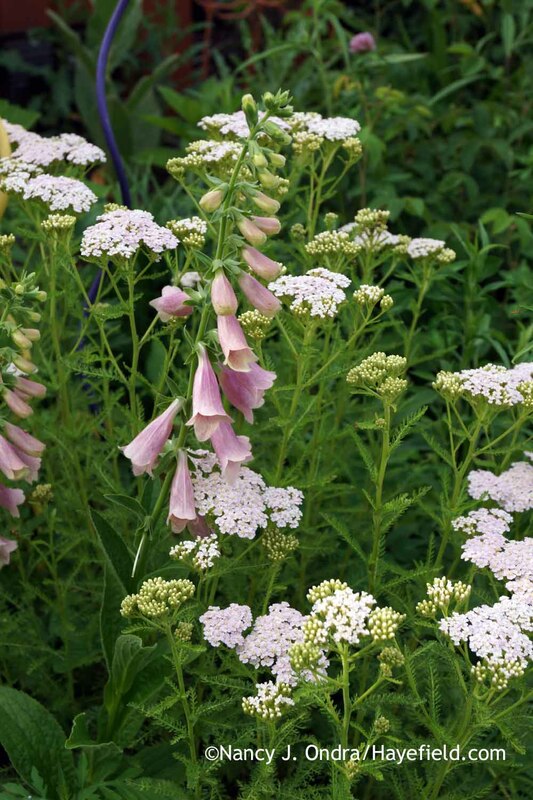 I had read that the big crambe is slow, but ten years? That’s some perseverance. How could anyone visit your garden and be bored? There’s some kind of sensory deficiency going on there. Hi Denise! I figure the crambe plant must have been there for several years to reach flowering size, so who knows? Maybe the seed came in mixed with something else. I’m more puzzled as to how I didn’t notice it; I do weed regularly. As far as visitors…well, I guess the garden shows off better in pictures than in reality to most people. 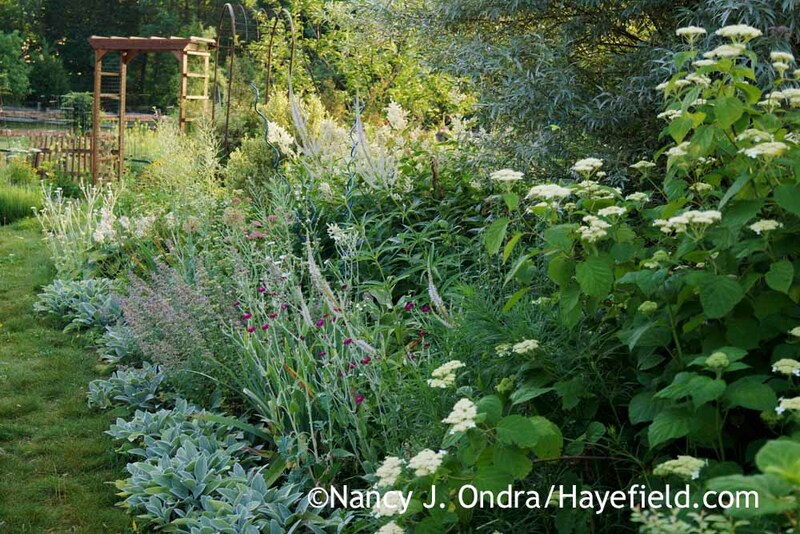 Love your garden Nancy and your photo tours.. Also enjoyed your new book very much and used a few of the suggestions. And of course thanks for using one of my photos! Have a great summer. Hey there, Greggo. 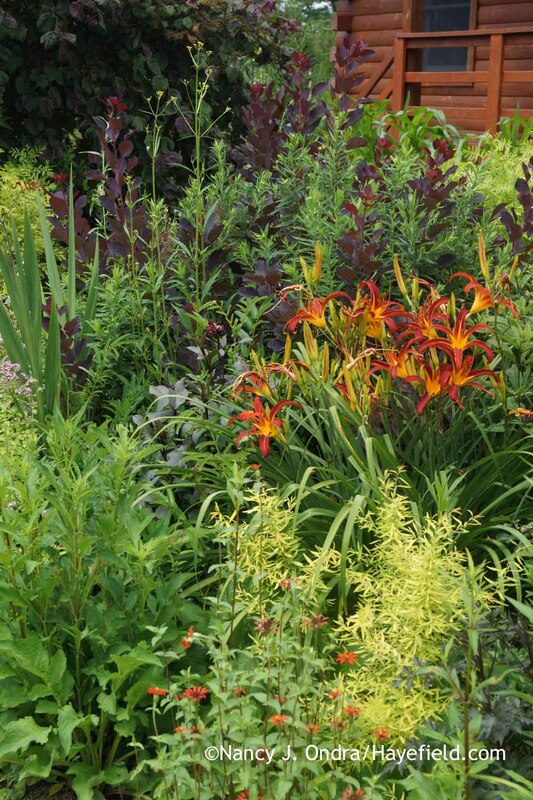 Great to hear that you like the perennial combinations book. I’m so glad that you could be part of it. Thanks for stopping by! As always, Nan, just so, so lovely! I had to laugh at the Peacock…I can’t imagine finding one of those in the garden! I think I remark every year about how much I love the Nigella seedpods you show…they are just so striking! I have to mention that my Patrinia are starting to bloom now and they always make me think of you…since I first discovered them via your blog! Hi Scott! Yep, I’ll never forget looking up from doing some maintenance on my brush mower and being eye-to-eye with that beautiful creature just a few feet away. 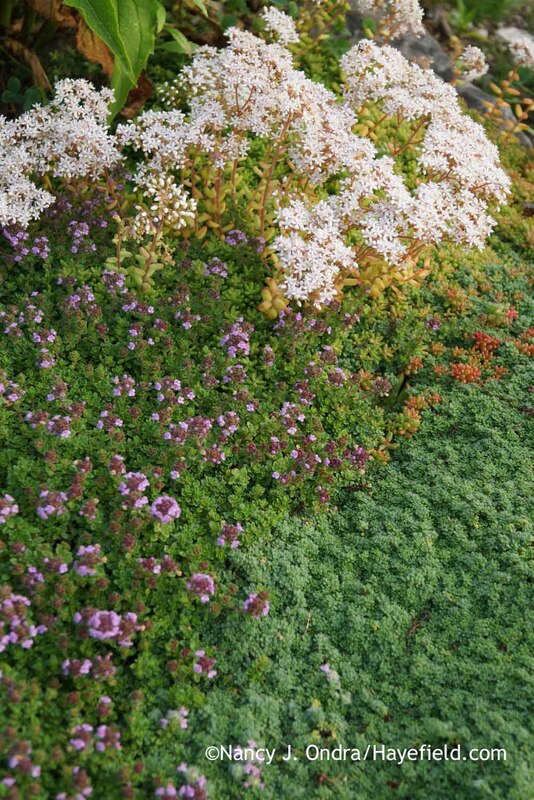 Enjoy your Patrinia blooms! 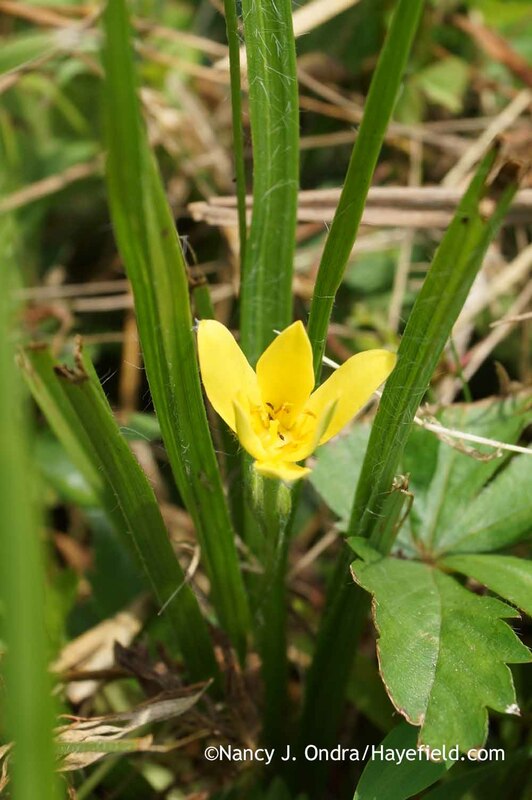 I find that if I cut the earliest-blooming plants back by about half in mid-August, they usually bloom again in October, extending the flowering season. 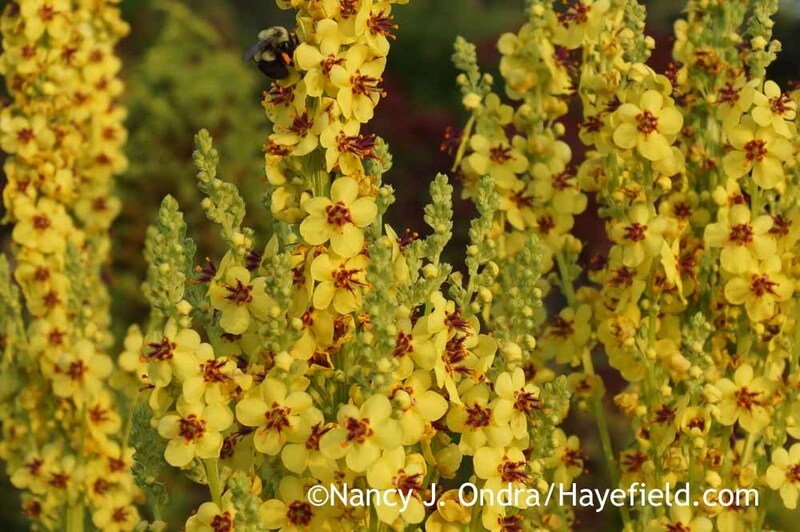 The list of interesting plants in your photos just never stops! Every post has a different new, exciting discovery of goodies! It is so nice of you to take so much time to put together so many pictures with captions for your posts. Thank you!! Hey there, Susan; good to hear from you. 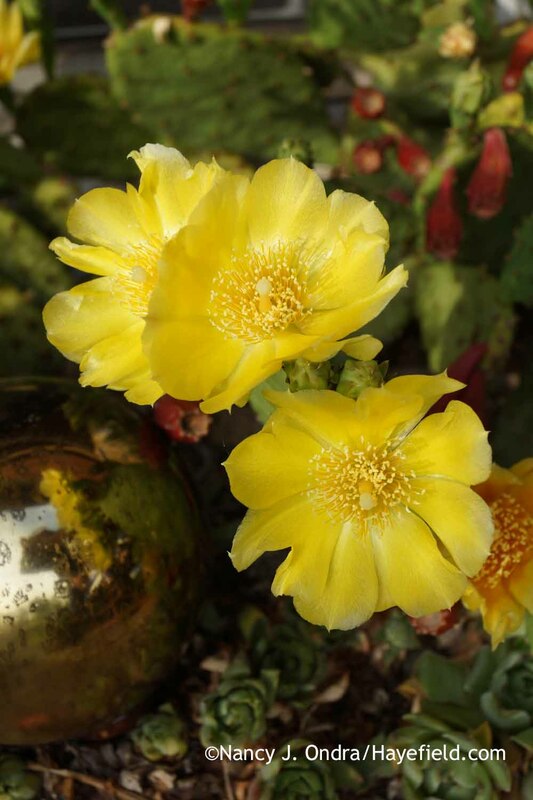 I’m so happy that you enjoyed the post: There’s a lot going on this time of year, even with the drought and heat and pests. Happy Bloom Day! Interesting that you haven’t had success starting C. cordifolia from seed. 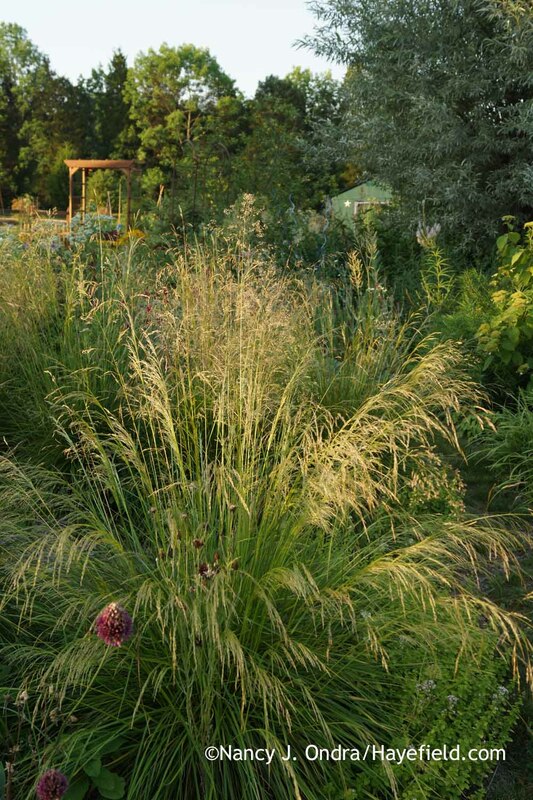 I have been wasting money buying plants that have never made it for years and this year tried seed with fantastic results. I started them in February in my greenhouse, just skipping stratification, and just plucked them from the flat as they appeared over the next couple of months. They are gorgeous large plants now. 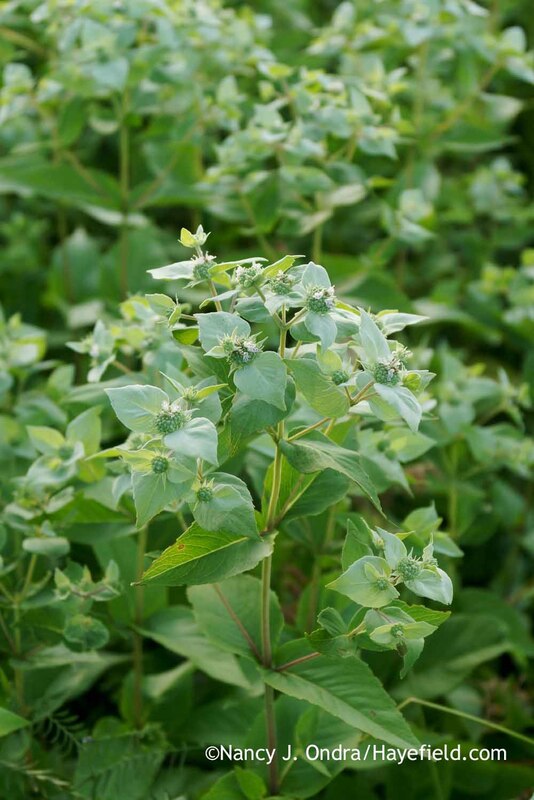 I hate to break it to you, but the plant in the picture isn’t C. cordifolia. 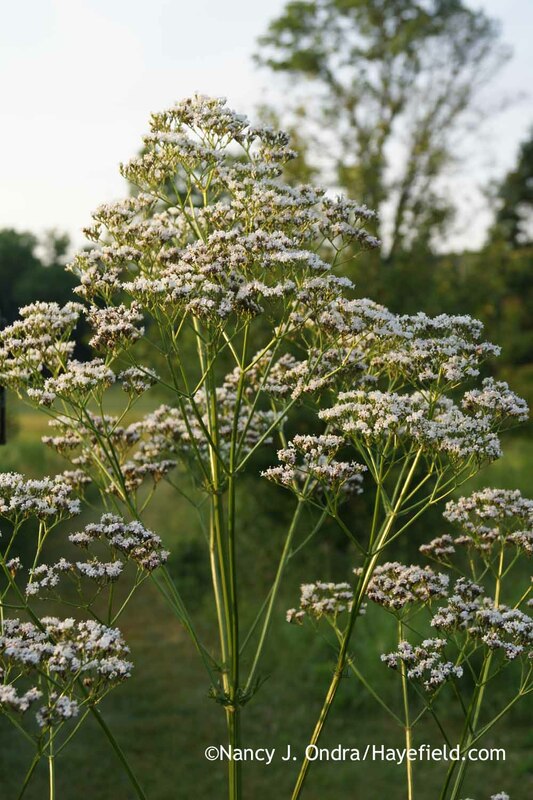 C. cordifolia is cruciferous for one, not an umbellifer, and not a Heracleum. 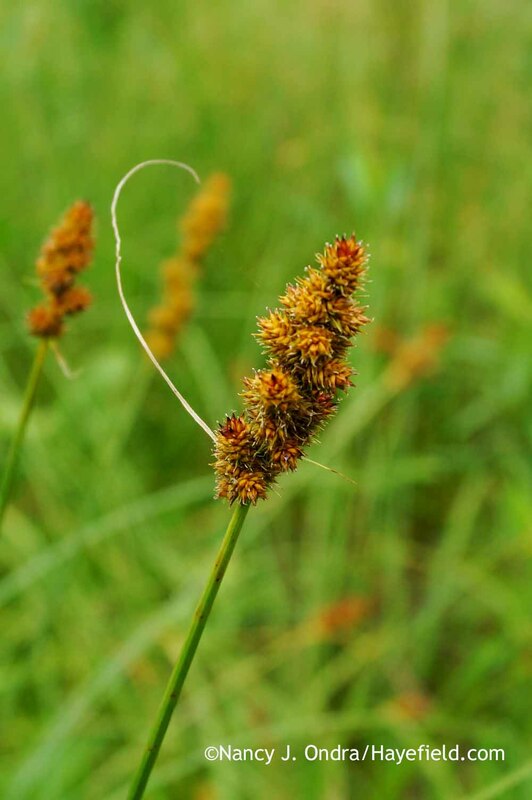 I recognize the pictured plant as H. sphondilium var. sibiricum which I grow. It comes up wild in some places. Good heavens: of course you are right that it is not a crucifer! I’ve seen Heracleum mantegazzianum in PA but not Heracleum sphondylium var. 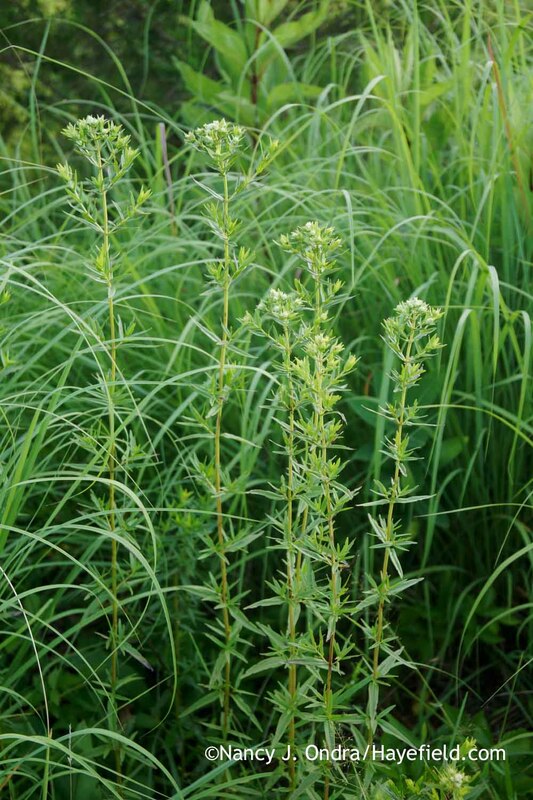 sibiricum, and I’ve never sown it, so I didn’t have a mental picture of it and never considered it as a possibility. Thank for the photos. Here in western PA, the same thing with lack of rain and many Japanese beetles. I have missed many rain storms that went south of my yard. I planted some of the same seeds that you did this year. I know what you mean about deadheading the Xanthos cosmos and I cannot keep up. 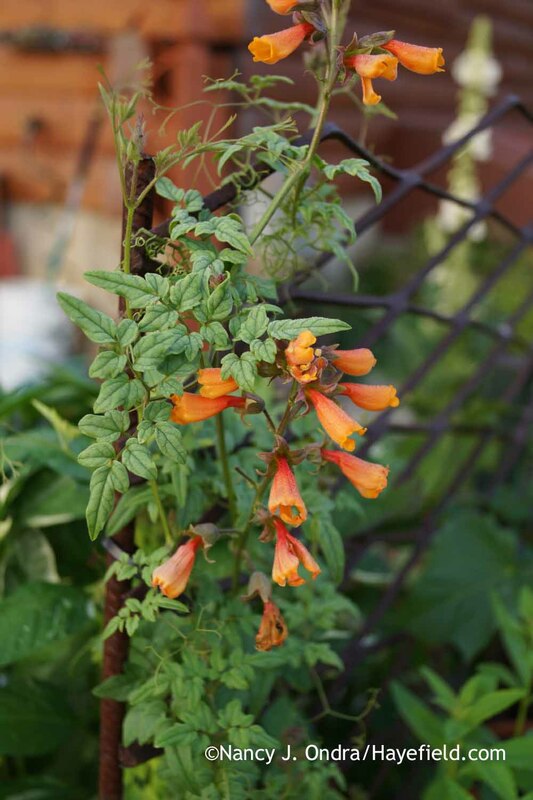 I planted annual lupine-Sunrise with them, but after germinating, they fizzled. 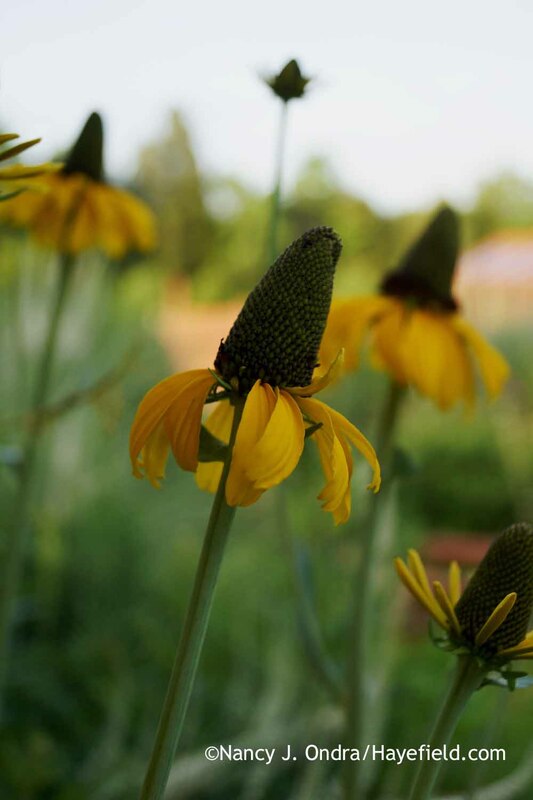 I also planted Prairie Sun rudbeckia but something ate them to the ground, which I blame deer. I had them eat the buds of rudbeckia before but never the whole plant. Thanks again for the tour. I feel your pain, Greg; it’s been a tough year, hasn’t it? It’s awful to see promised rain get so close but miss by a mile (for real). The deer are starting to come into my garden now too, to nibble on some of the containers that I water regularly. Here’s hoping we get some rain soon! Hello Nan–enjoyed your pictures very much. 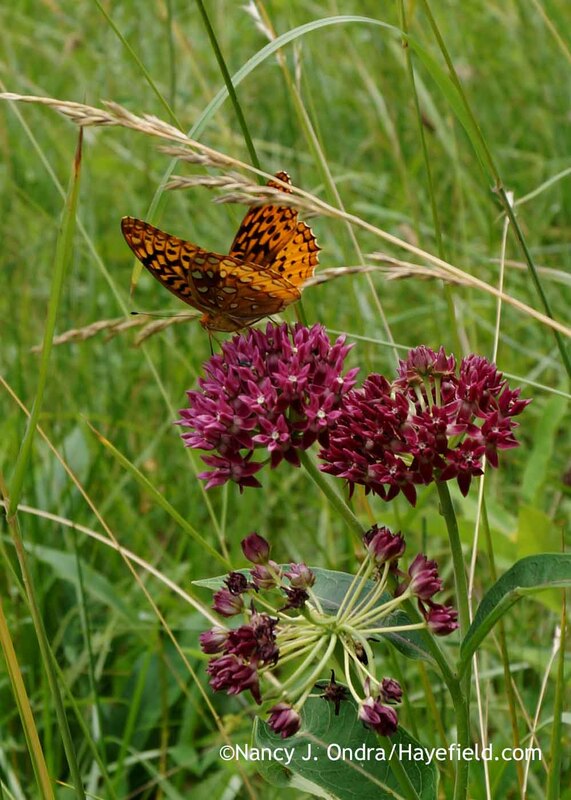 I bought some purple milkweed seeds (so expensive!) and I am wondering, seeing your plants, did you start seeds in pots as you did the xanthos cosmos or outside. And if outside, did you plant in fall or spring. Thanks so much! I am trying to help the monarchs. BTW I live in NE Oklahoma. Greeting, Carol! I’m not surprised that the seed was expensive. 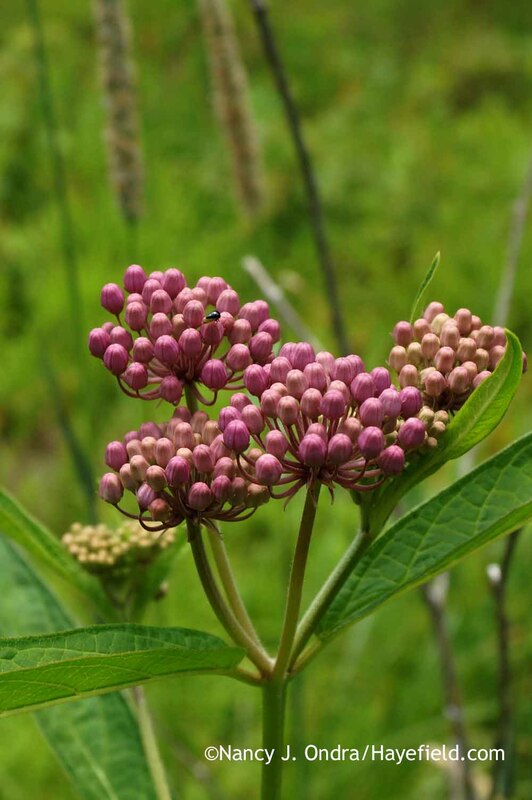 In my experience, Asclepias purpurascens sets very little seed. 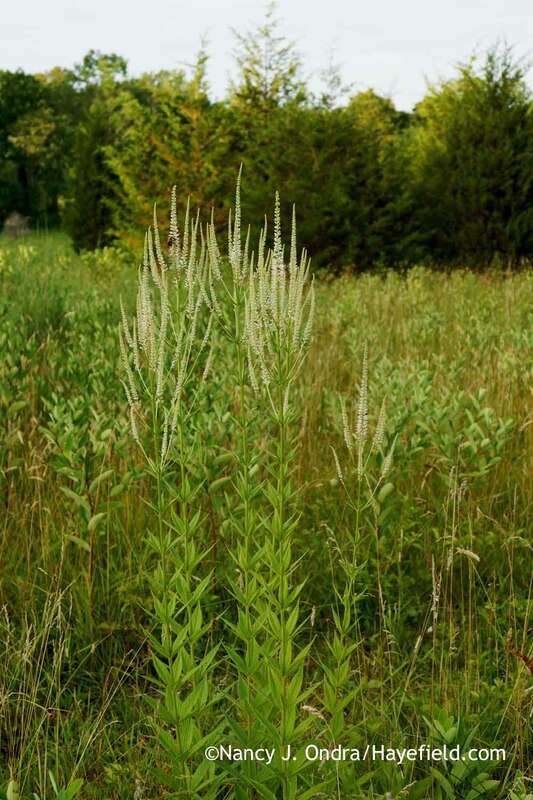 The plants I showed here are growing wild in my meadow and have been there for many years. 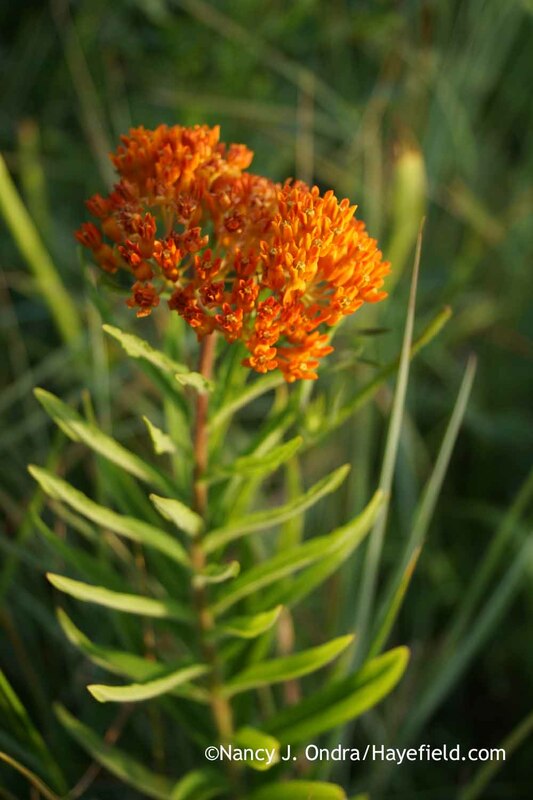 You might want to try common milkweed (Asclepias syriaca), as it should be much easier to start and grow. Nan, I’m late to the party this month but wanted to say how much I enjoyed visiting your garden once again. 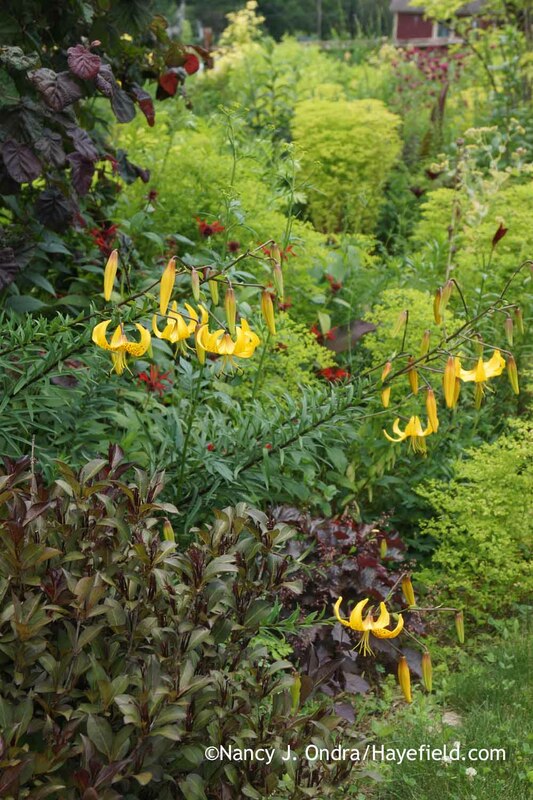 It is such a treasure trove of interesting plants. I have some good ideas for next year now. 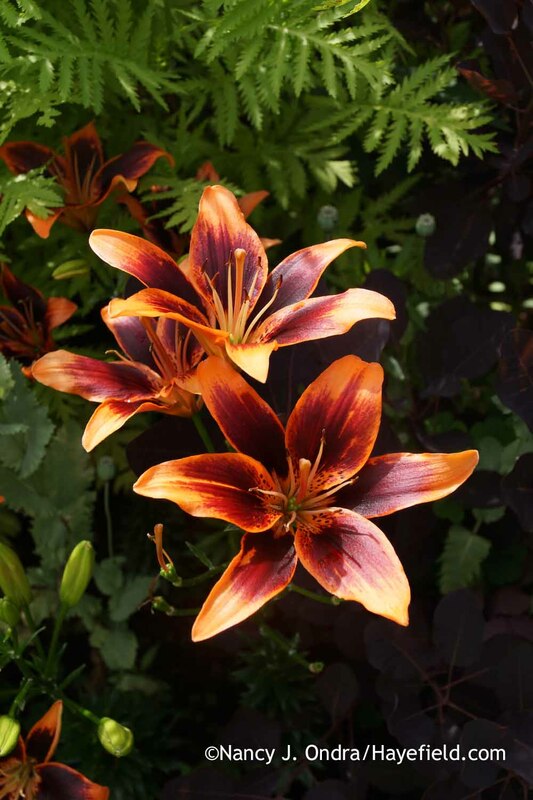 As a daylily aficionado I admired both H.’Milk Chocolate ‘ and H. ‘Nona’s Garnet Spider’. I have both of them in my garden now and enjoy them very much. 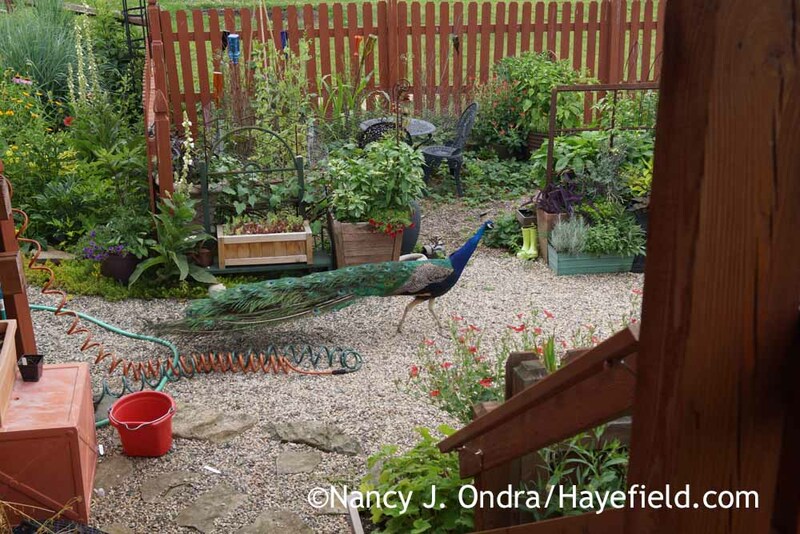 I once had a peacock visitor in my garden too. He came in with the turkey flock that routinely feeds under my bird feeders every morning. I thought I was hallucinating! He was gorgeous too. I haven’t seen him since but a few weeks ago there was a lone Canadian goose hanging out with the same flock. Happy summer and keep the garden reports coming. Hi Kate! I’m glad to hear from you whenever you get here. The heat and drought seemed to cut the daylily display short, but it was nice while it lasted. Looks like we may be getting a break with some rain tonight, finally; I hope you do too. And how nice that your turkeys are friendly to strays! Please, what camera you used to these photos? It’s a Sony Model SLT-A65V body and Model SAL18552 lens.